Mother’s Day is on the horizon! 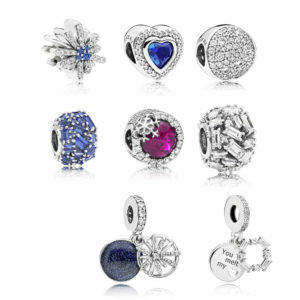 Are you overwhelmed trying to find the perfect gift for mom? 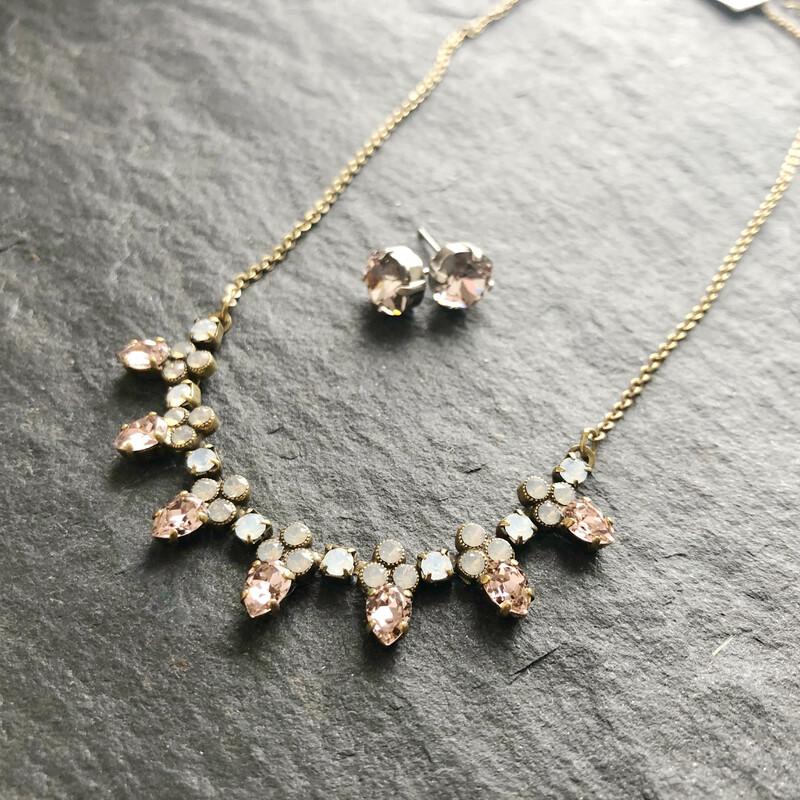 Worry no more- we have compiled a list of our favorite things to make mom sparkle this Mother’s Day! From the classics to unique finds, we have included something for everyone. Can’t live without something on the list? Many of our items are available on our new online shop! 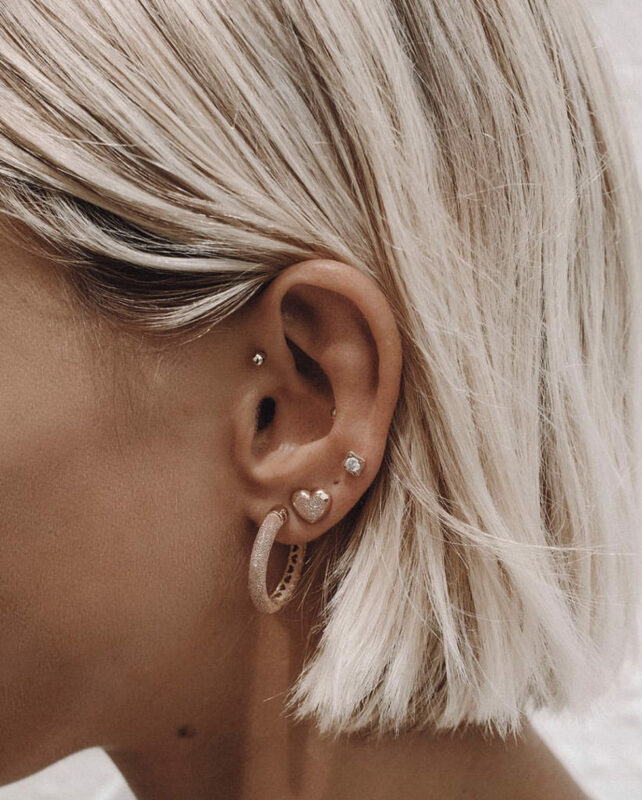 Does mom love jewelry that is both unique and meaningful? 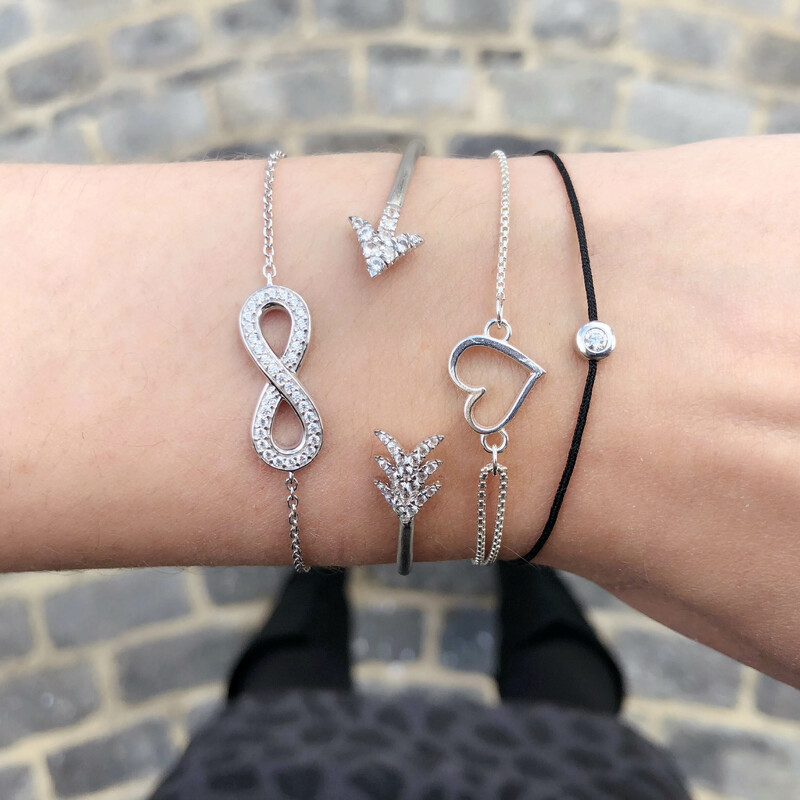 Our new Talisman Collection pieces might be just the thing for her! 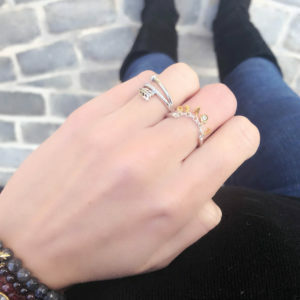 A talisman is a jewelry object that is believed to bring good luck, protect against harm, and is charged with the meaning of a chosen symbol or word. 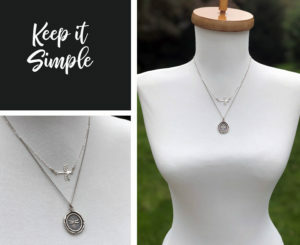 Our talisman necklaces are delicate pieces made from sterling silver that have a word, phrase, or symbol. 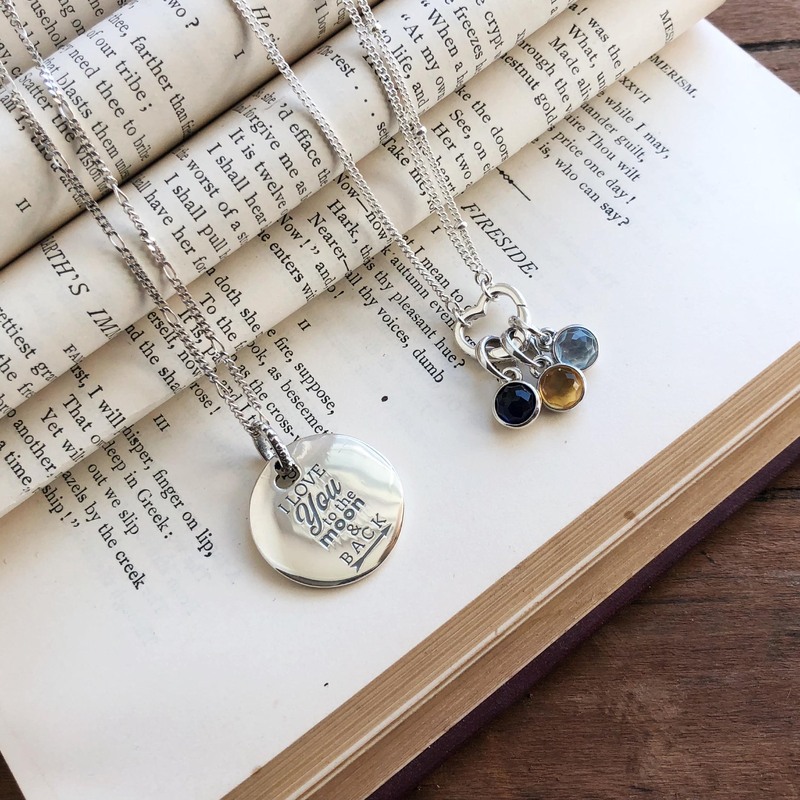 Some of our talismans are made from antique book pages, making them one-of-a-kind- just like mom! 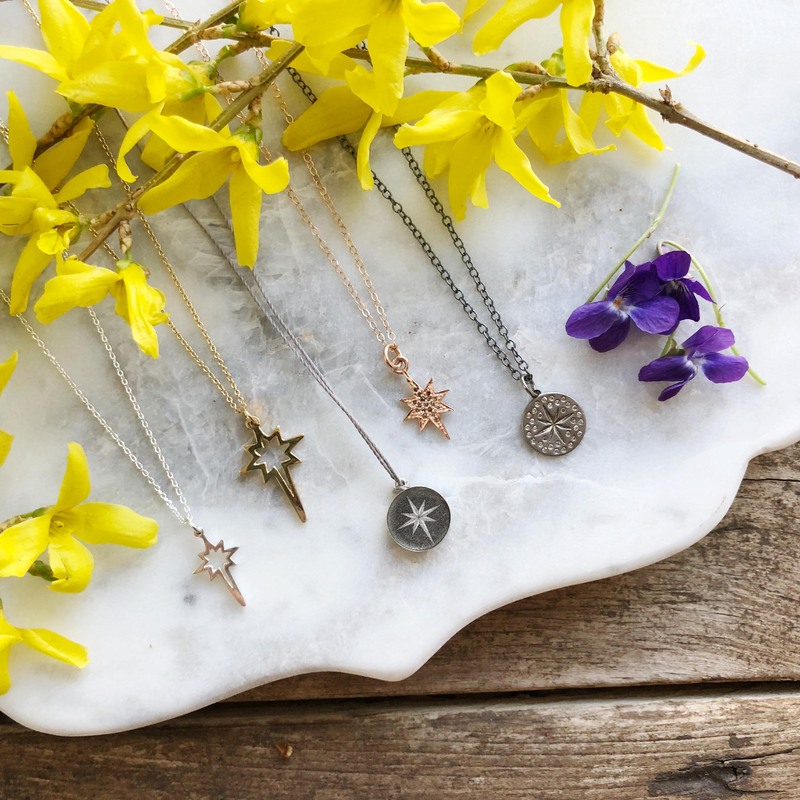 Each of our symbol talisman necklaces comes with a meaning card explaining the significance behind the symbol. 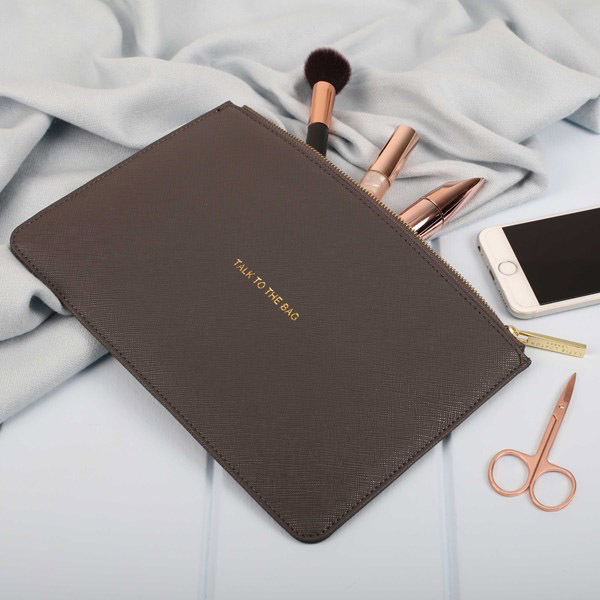 Want to personalize it even more? 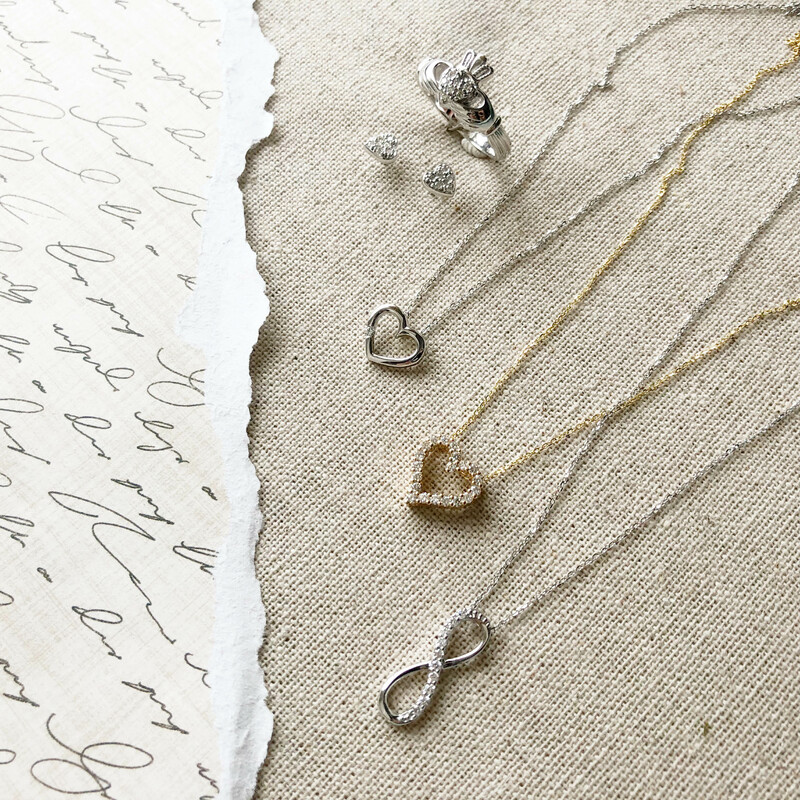 Add some small charms from our Waxing Poetic collection, such as birthstones or initials of family members! Our Talisman Collection also includes soy candles scented using essential oils. 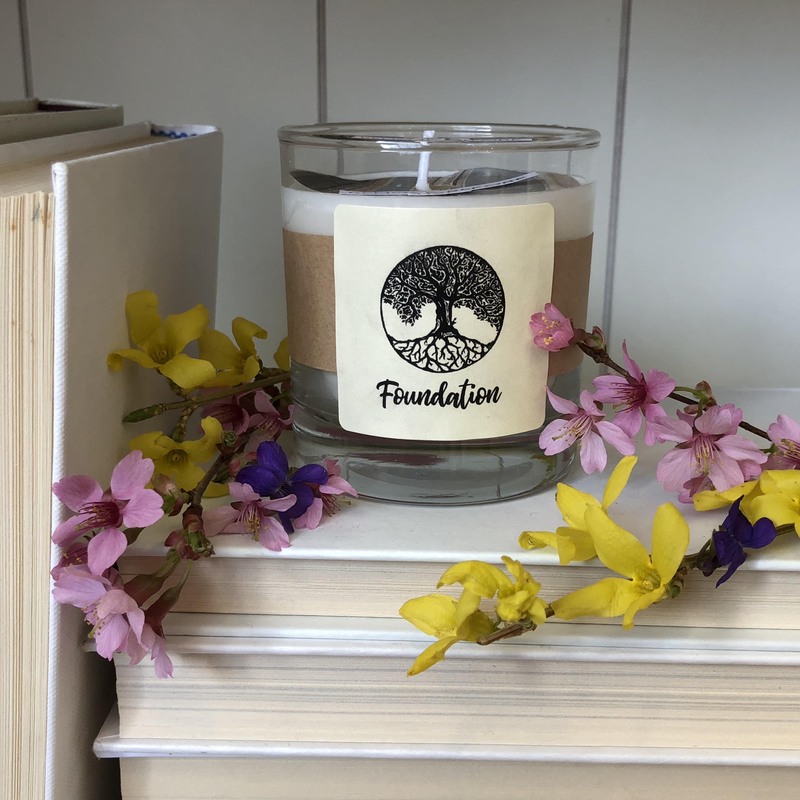 Each candle comes with a booklet explaining the symbol meaning and the benefits of the essential oils used. Interested in learning more about our Talisman Collection? Check out all of our Talisman offerings in our online store here. Are fine details and customizability things that mom values? 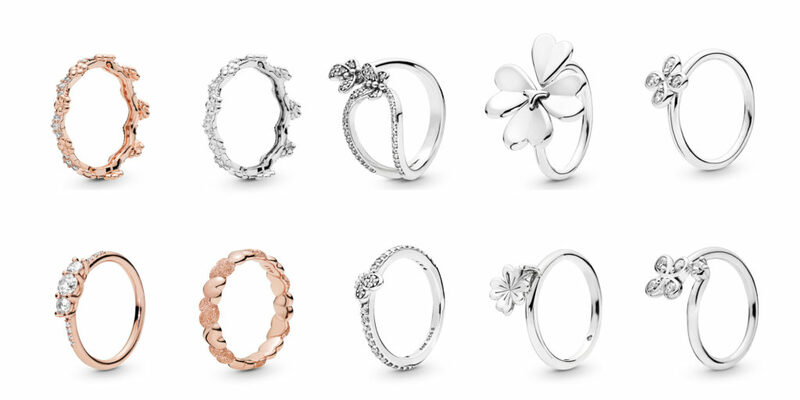 Pandora Jewelry is right up her alley! 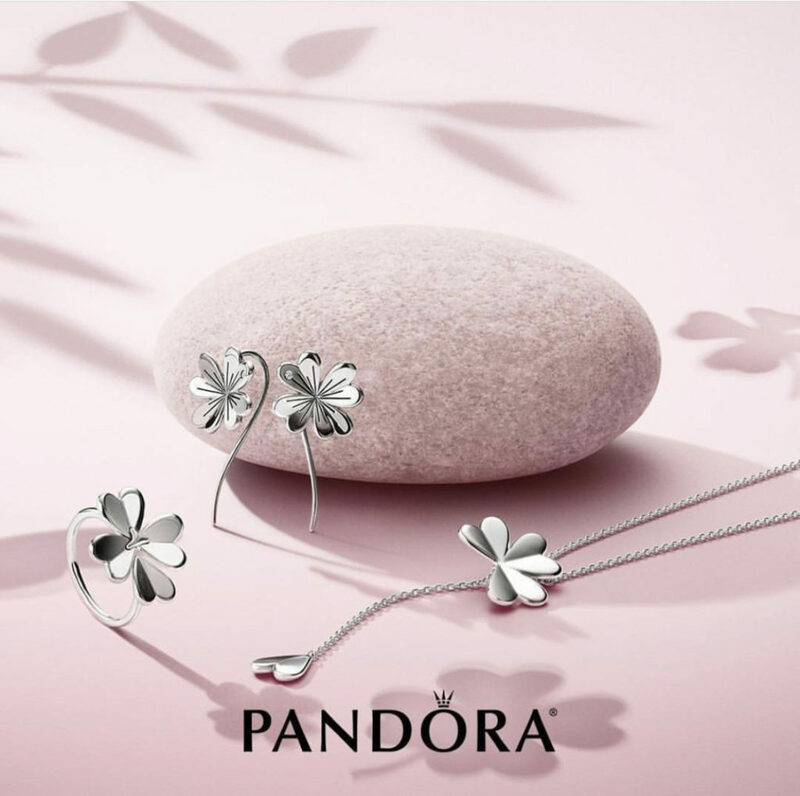 Pandora charms and jewelry are lovingly crafted from sterling silver and Pandora Rose with hand-set stones, making a high quality piece with beautiful details. 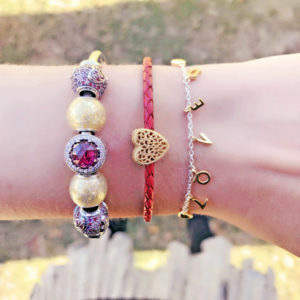 With a wide selection of varied styles and themes to choose from, it is easy to make a custom bracelet that can represent what mom means to her family or appeal to her individual sense of style. 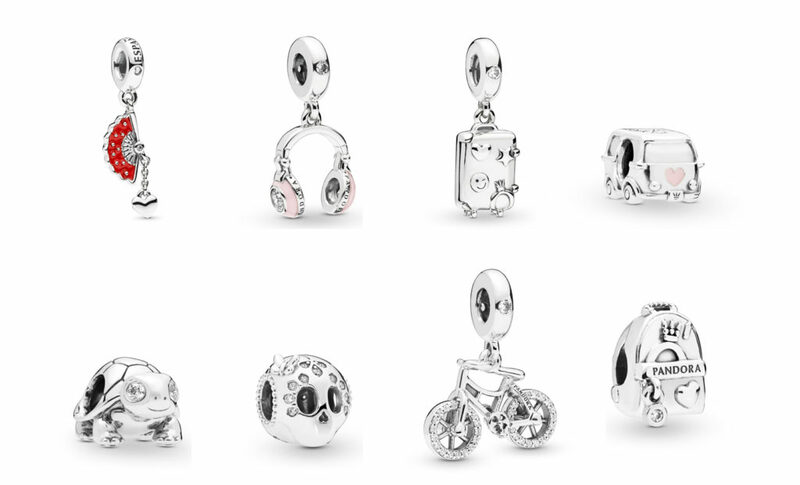 Each year Pandora releases a new collection geared towards Mother’s Day. We love this year’s new additions! 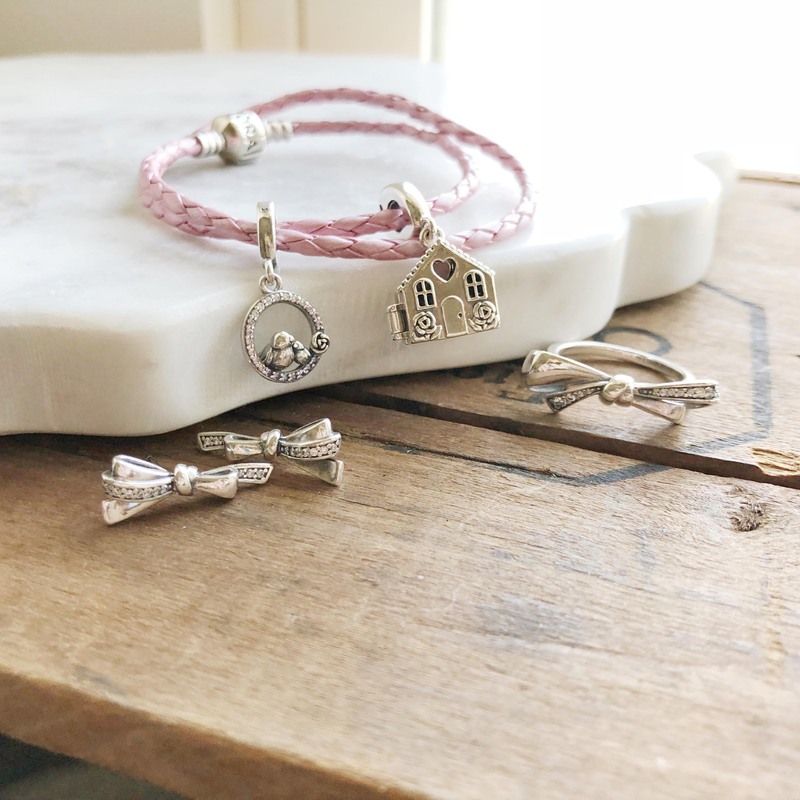 The Bonds of Love jewelry pieces, featuring a stylized bow that represents that strong bond between a mother and her family, are classic and elegant. 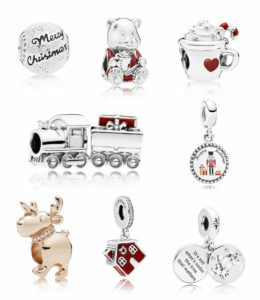 The charm selections are also very sweet- we particularly love the mother and baby bird dangle charm. Is mom just starting out on a bracelet or is her bracelet almost full? 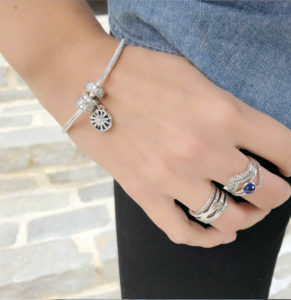 Check out the new Pandora open bangle! 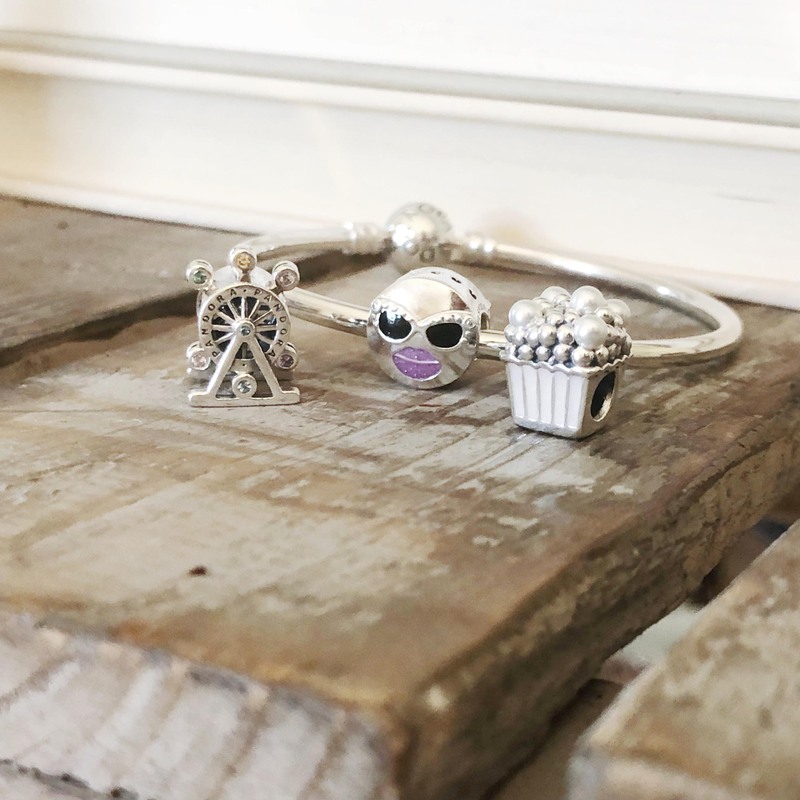 This is our favorite Pandora piece- it is easy to put on, includes two silver stoppers to keep your charms in place, and is very comfortable and stylish! 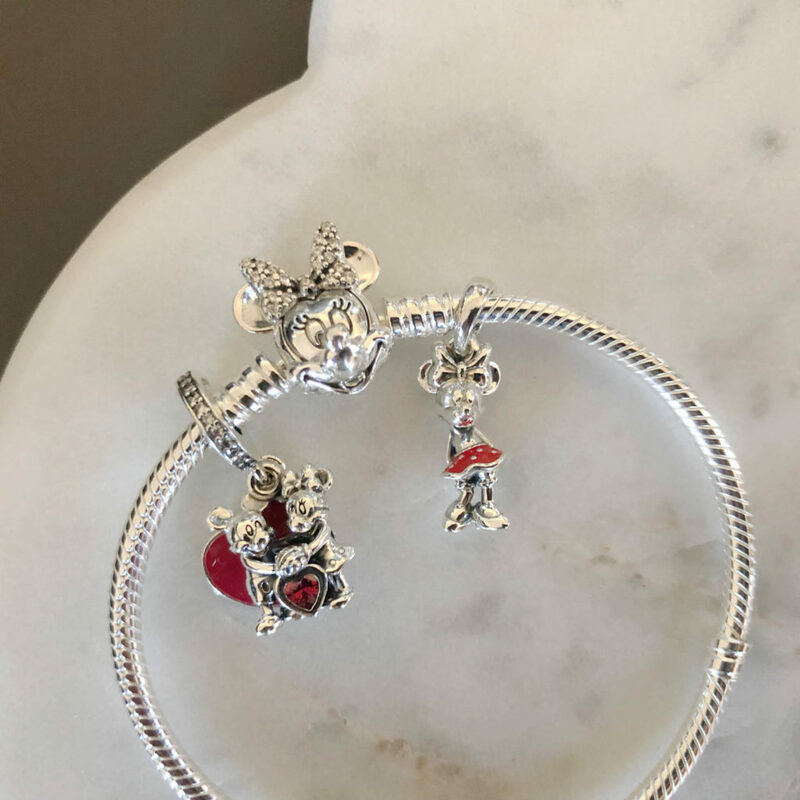 You can wear the bangle with your favorite charms, a simple statement charm, or turn it around and wear it by itself as a cuff with no charms at all! Is mom one-of-a-kind? 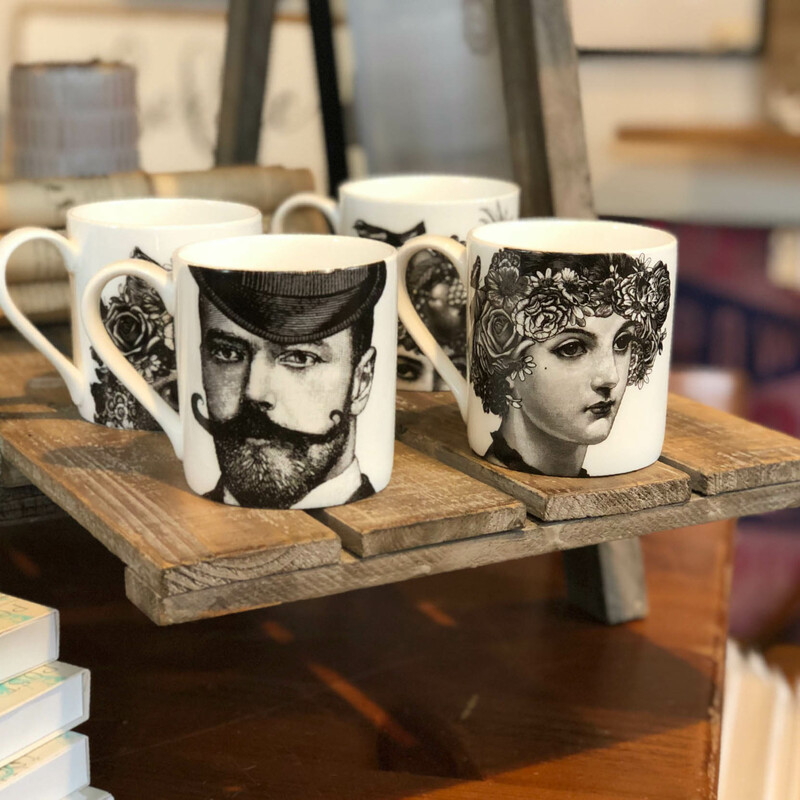 One of the best ways to find a unique gift to suit her tastes is to shop locally sourced treasures handmade by some of our smaller local artisans. 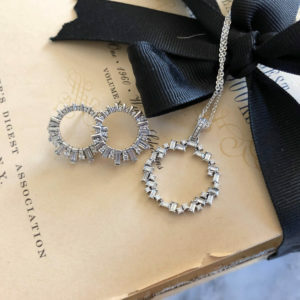 If mom has a special connection to Bethlehem, we have a variety of Star of Bethlehem jewelry made especially for us that would be a great way to celebrate her own roots or where she has decided to grow her family. 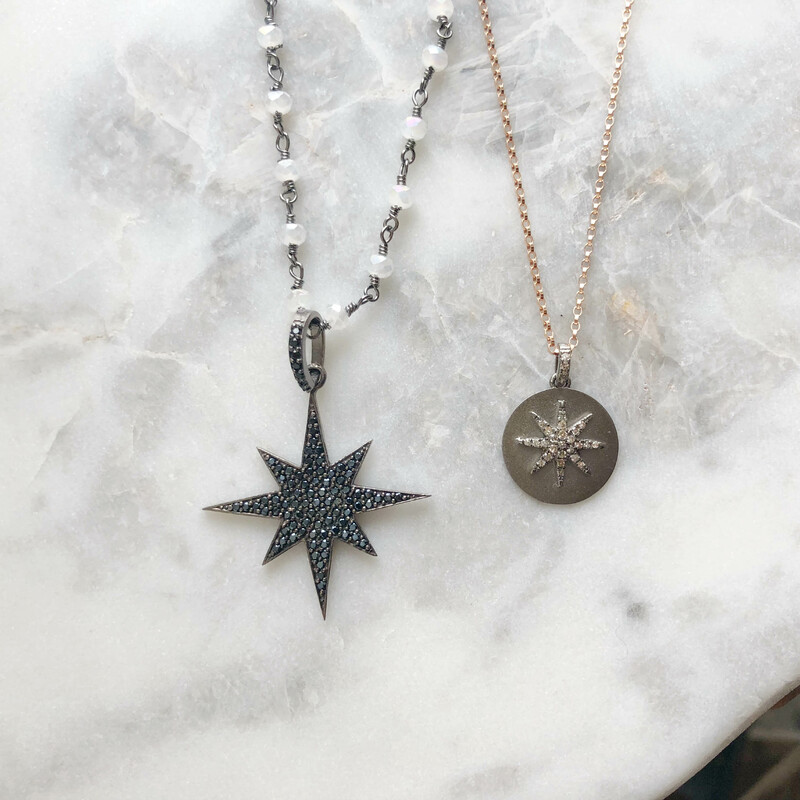 We love the Star of Bethlehem symbol for moms who work in the St. Luke’s network as well! 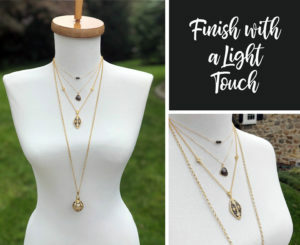 Another local favorite is one of our exclusive designers, WinterLemon Jewelry, which is handmade in Bethlehem. 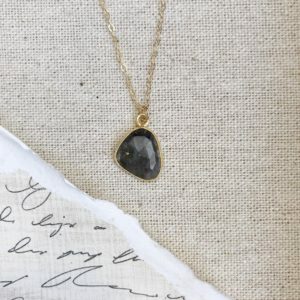 These pieces are handmade from natural gemstones and many of them are one-of-a-kind! 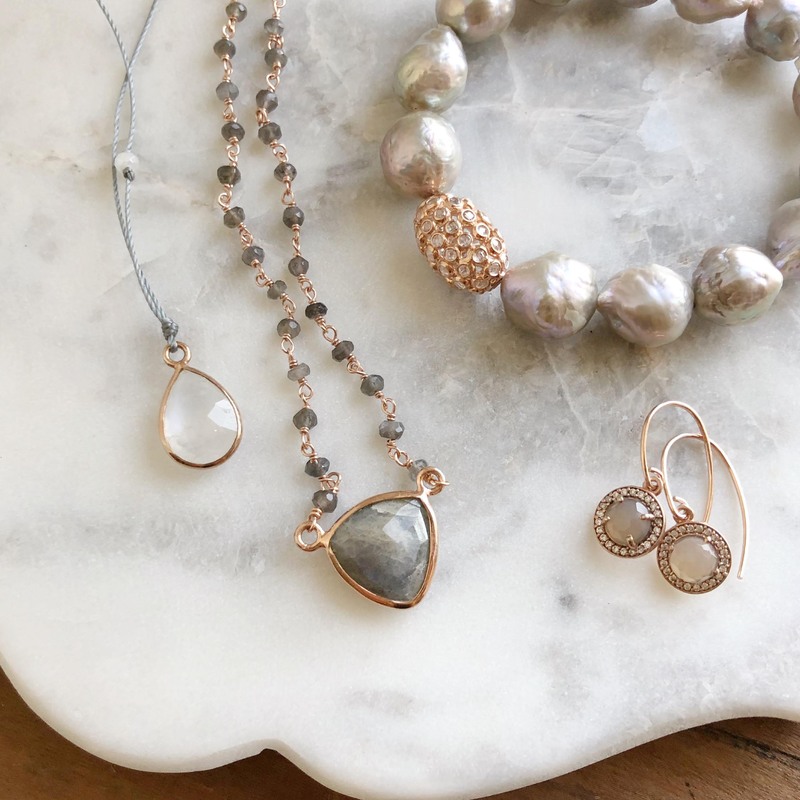 We particularly love WinterLemon’s rose gold pieces with labradorite and moonstone for spring. 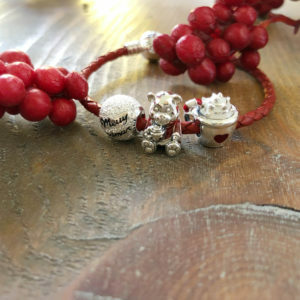 If mom never leaves home without her stack of bracelets, WinterLemon’s new Wellness Collection is a great choice. 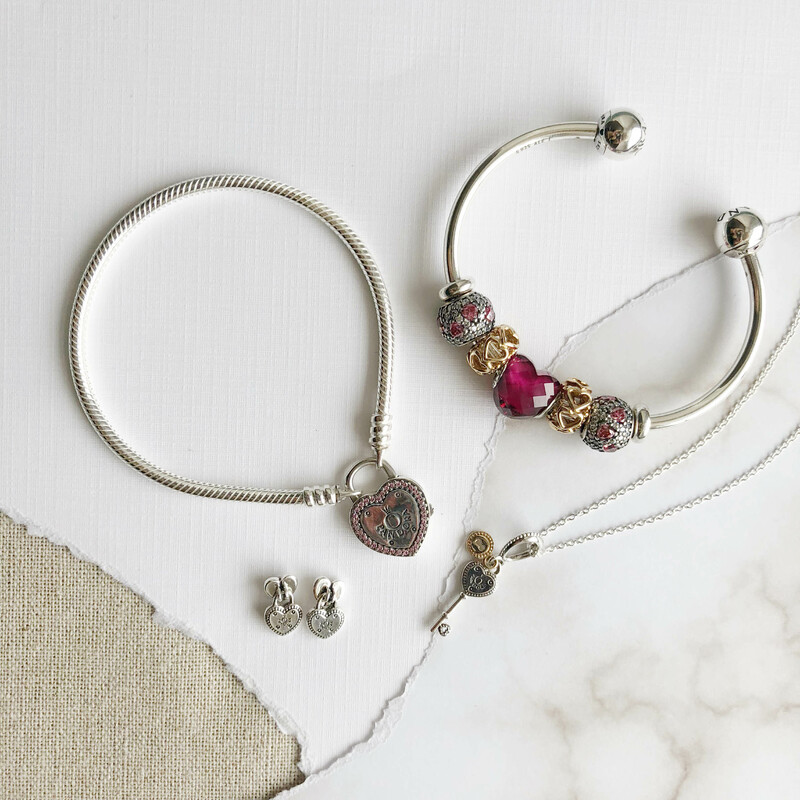 These stretch bracelets are made from natural gemstones and come with a card explaining the properties of the stone used. Starting at $16, it is easy to put together a stack of complementary colors and textures to make mom smile! 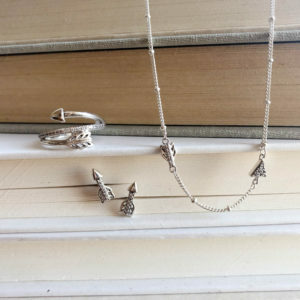 Want to explore more of our local designers? You can find WinterLemon here and our Star Collection here. 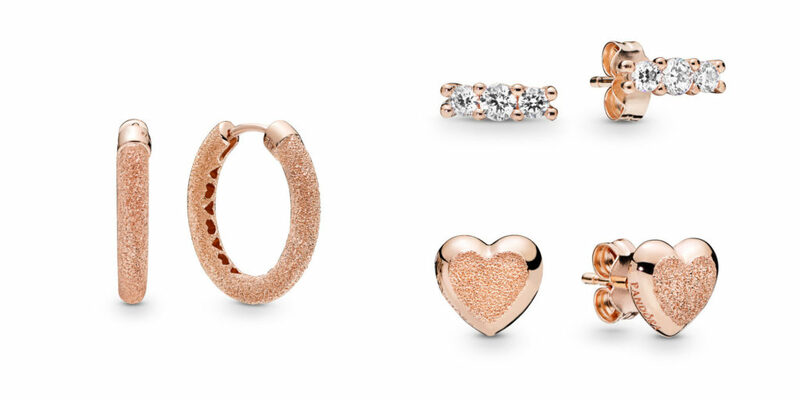 Gold is back in a big way! 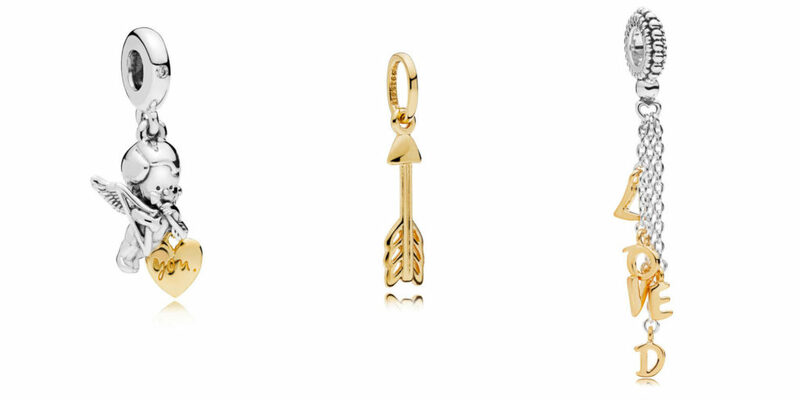 For the mom who is on-trend, gold jewelry is a must have. Golden tones are especially great for the sunshine loving mom who lives for those perfect summer days. 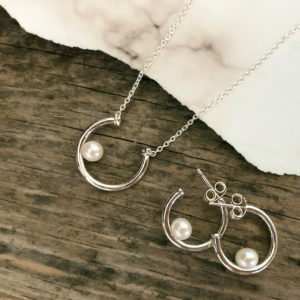 Our golden pick for Mother’s Day is Julie Vos jewelry. 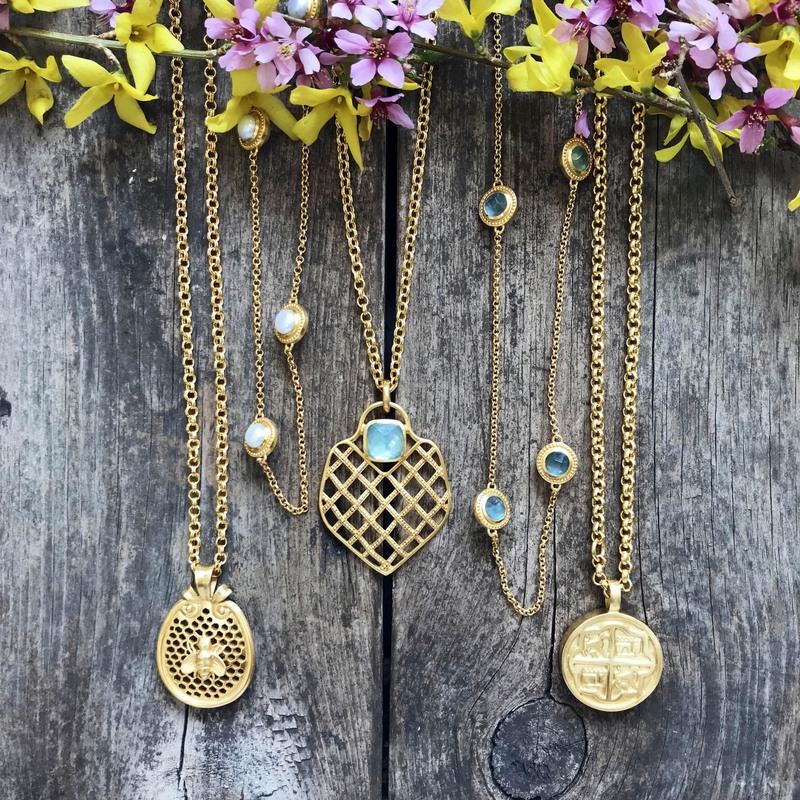 Constructed of 24k gold over brass and studded with semi-precious stones, pearls, and glass, these nature and architecture inspired pieces combine classic styles with current colors and textures. 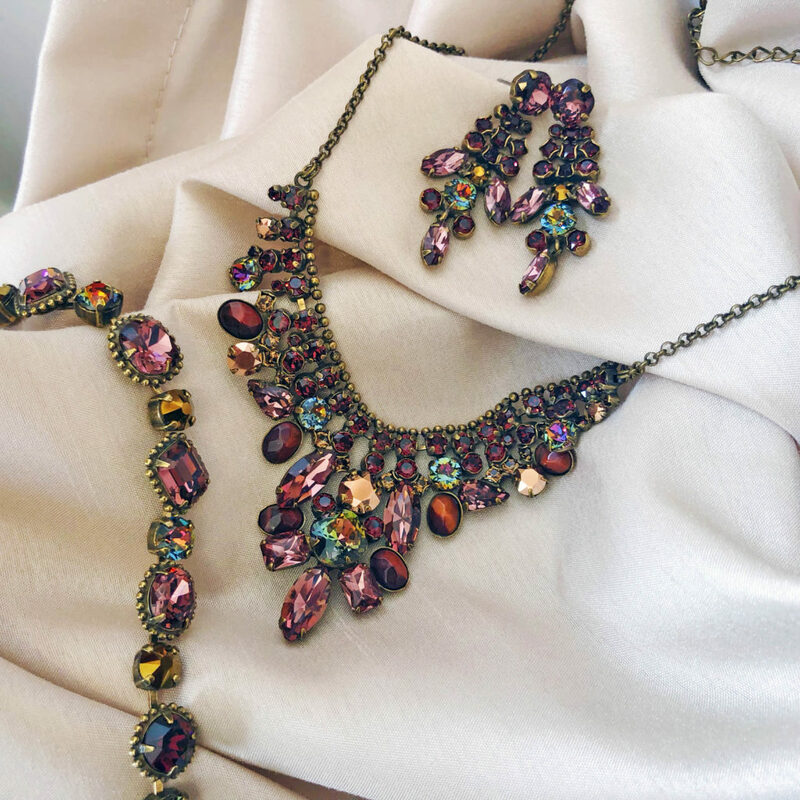 Some of the most show-stopping Julie Vos pieces are her statement necklaces. 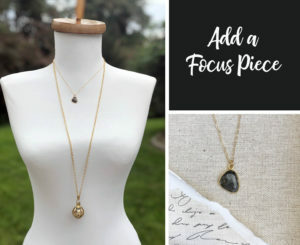 Many of her longer layering necklaces have a special loop to allow them to easily be worn doubled, giving them an extra versatility. 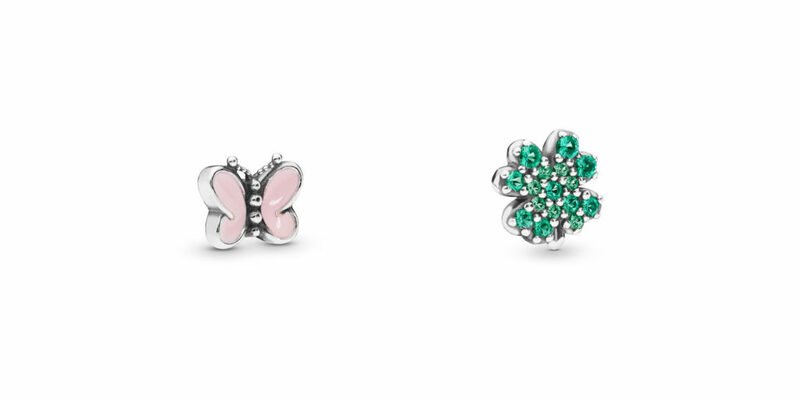 The iridescent aqua pieces are our favorites- they remind us of a bright summer sky! 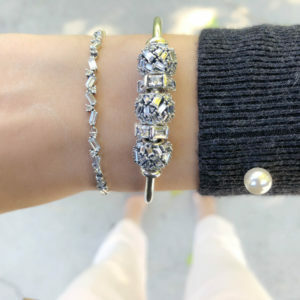 For the mom that prefers bracelets, Julie Vos’ stacking bangles are also a real treat! 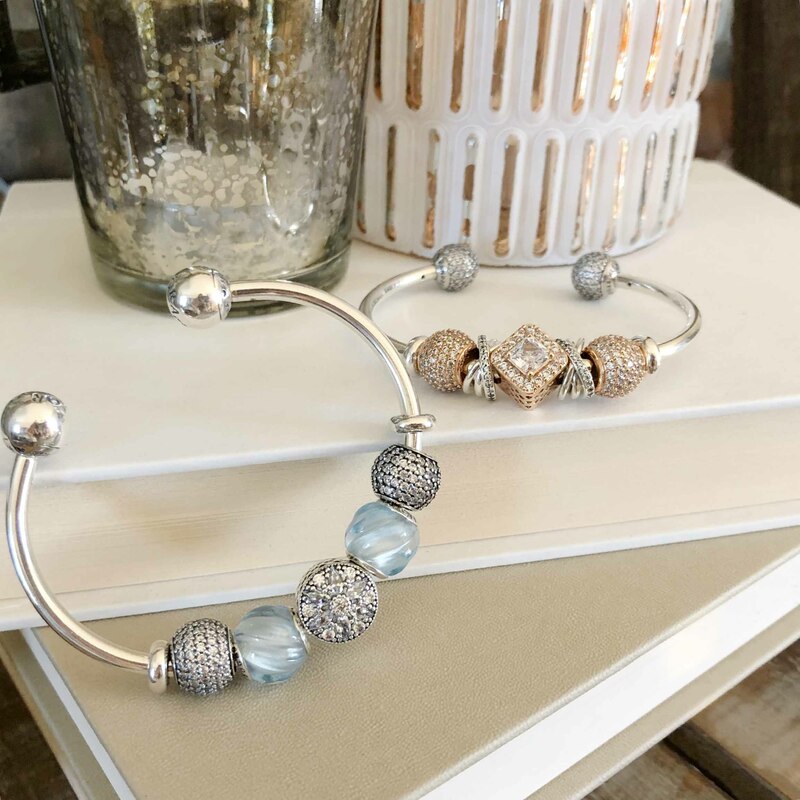 We love creating stacks with her Milano 6-stone bangle in different colors. 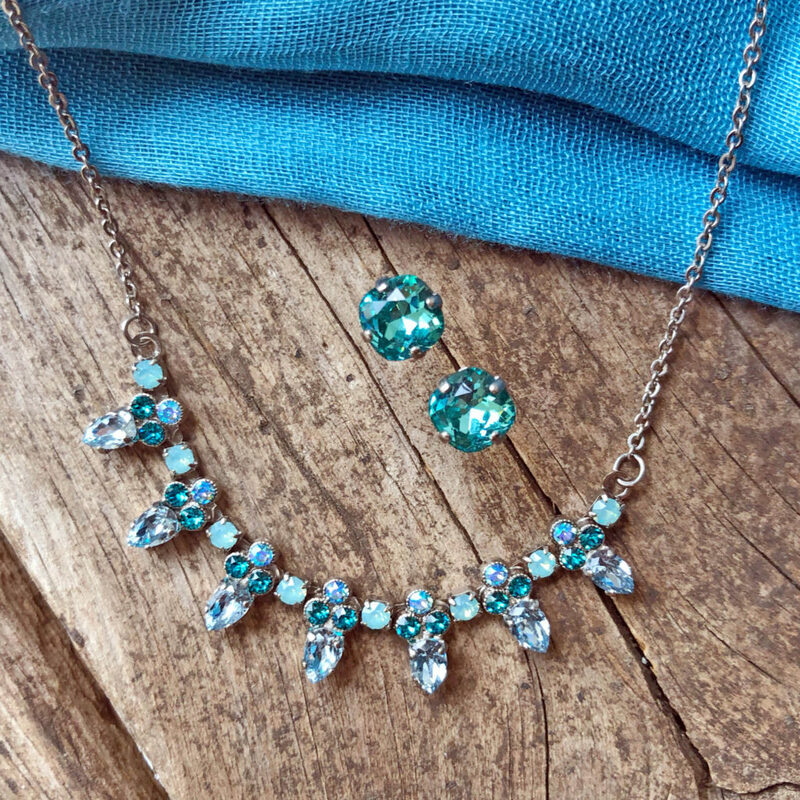 The pearl and aqua blue stones make a beautiful combination! 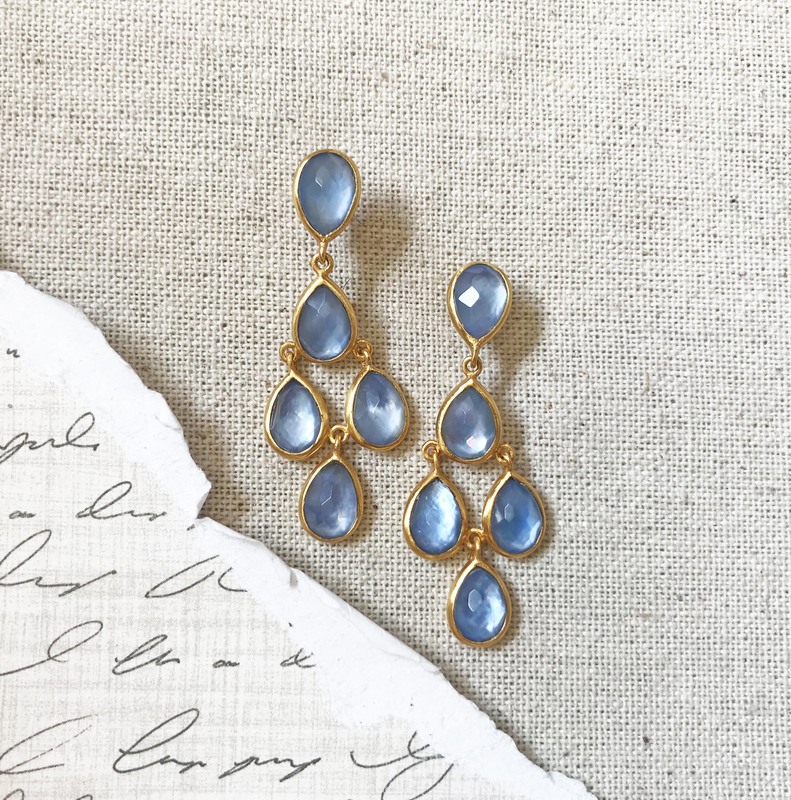 Another one of our favorite pieces from this season’s collection is the Clara Chandelier earrings in iridescent blue chalcedony. 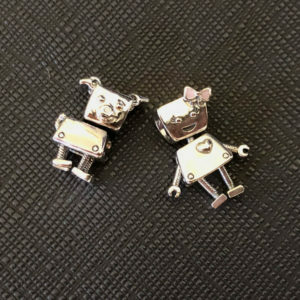 The color in these earrings is so vibrant and unique! Do you think mom would love Julie Vos as much as we do? You can see more of the collection here. Many say that mom is the heart of the family- she nurtures us through the important milestones of our lives and can make simple moments into lifelong memories. 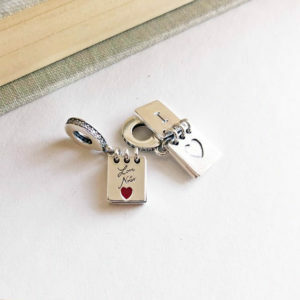 We love the idea of a charm locket honor her role as memory maker and keeper. 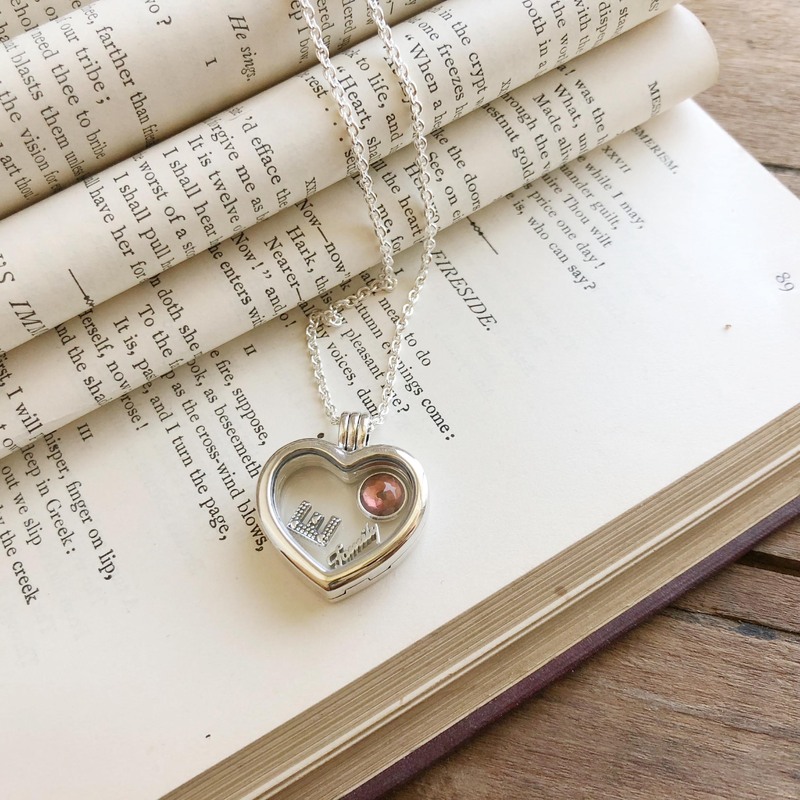 Smooth Heart Locket ($125) with Initial ($10), Birthstone ($20) and Family ($10) petite charms. 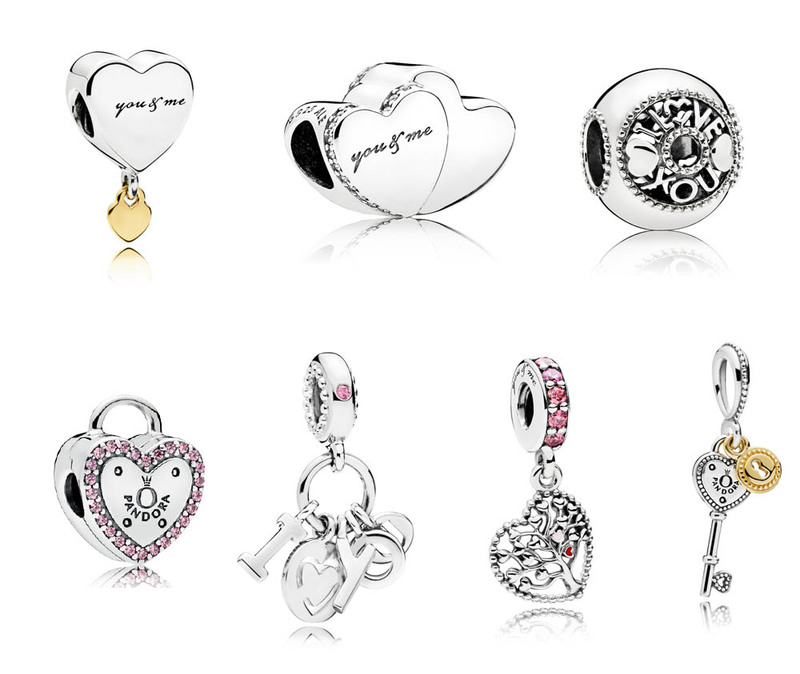 Pandora’s Memory Locket and petite charms make it easy to create the perfect vignette for mom. 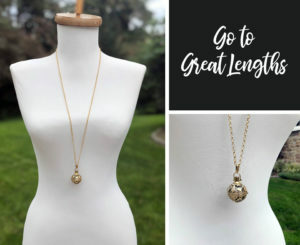 The lockets themselves are available in several different shapes and sizes and use high-quality sapphire crystal to ensure a locket that will stand the test of time without becoming scratched or cloudy. 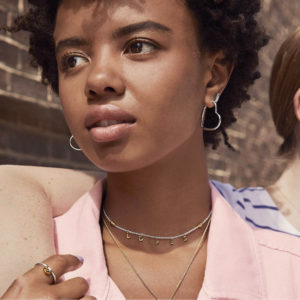 With several family-related charms, birthstones, and the new initials collection, you can create a collection with a piece that represents everyone in your family. 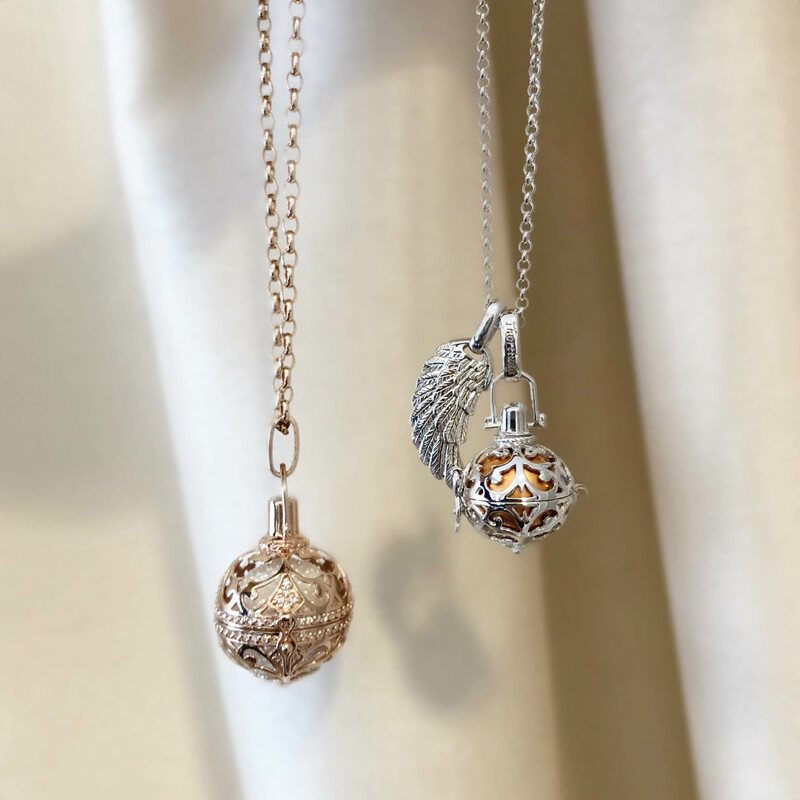 One of our favorite features of the sparkling lockets is that they are reversible! 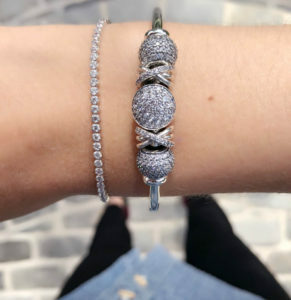 Wear them sparkly side up when you are feeling like you need a little shine or wear them with the smooth silver side up when you want a more casual look. Mom is a lot like a diamond- she brings light and sparkle into our life but is also one of the strongest things in our world. 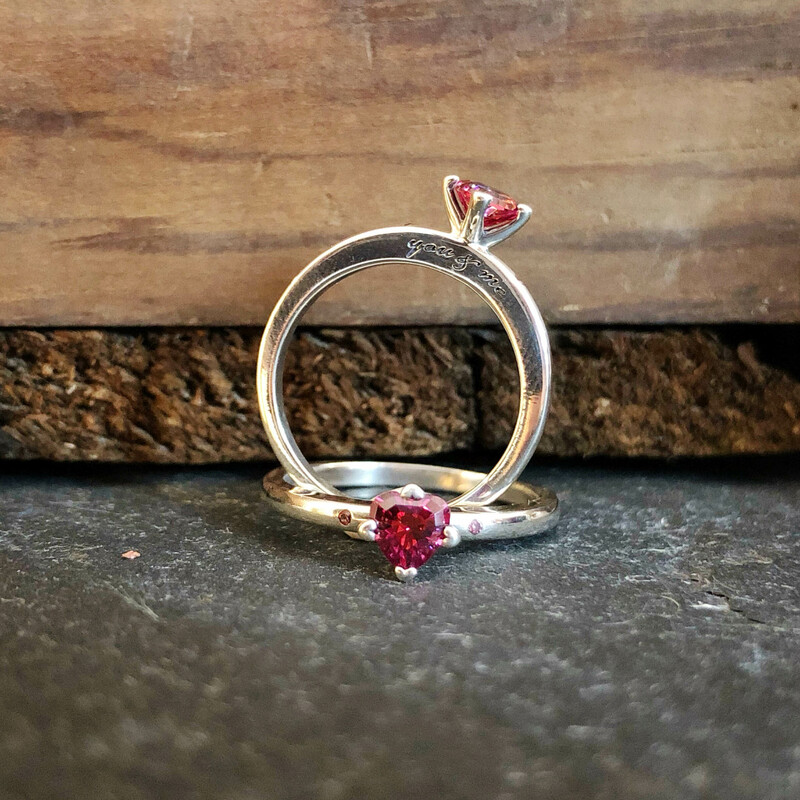 Bring a little radiance into her life with a piece of fine jewelry to show her how much you appreciate everything she represents. 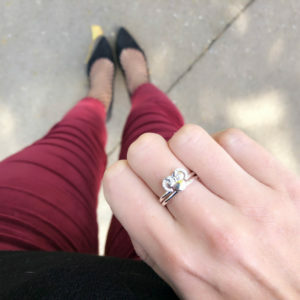 Unlike costume and silver jewelry, which will not stand everyday wear over the years, a piece of gold jewelry is something that she can cherish throughout her lifetime. 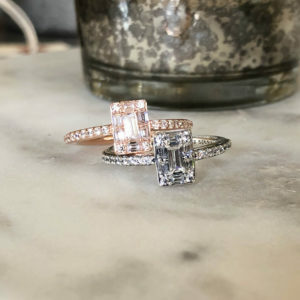 When looking at fine jewelry, we love a simple silhouette to ensure that it is something that mom can wear with as much style 10 years from now as she will today. 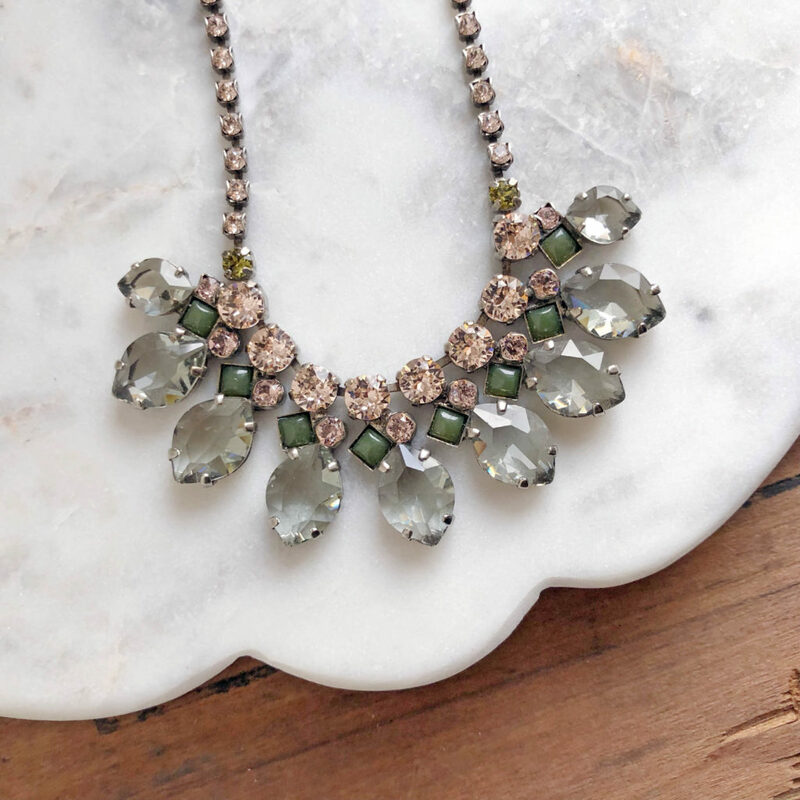 We love this diamond solitaire necklace because it is both elegant and classic in style. 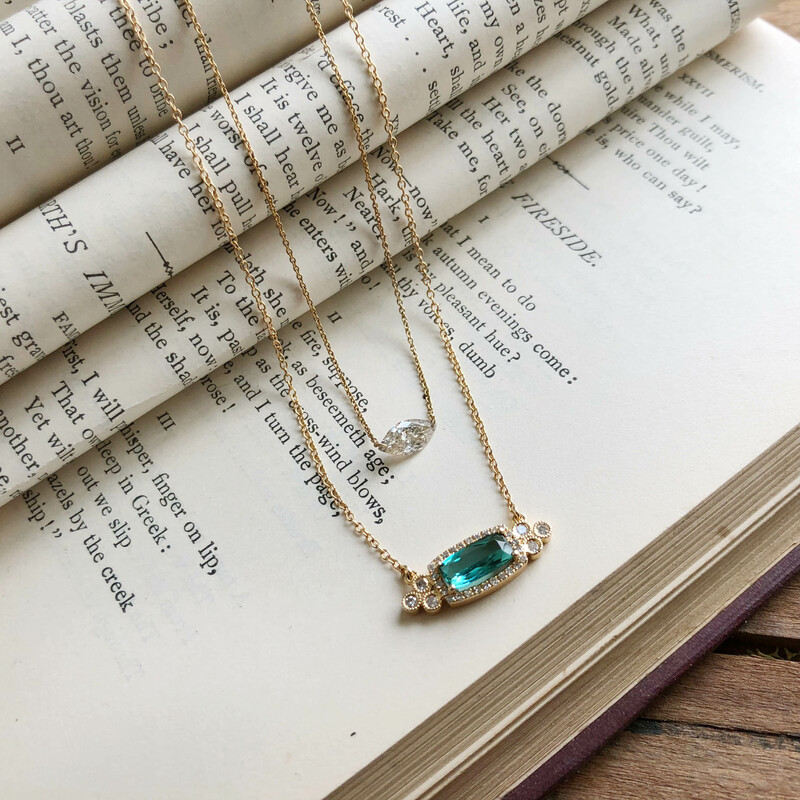 For something more unique, this Paraiba Tourmaline & Diamond necklace is one of our absolute favorites- this rare stone has such a unique color! 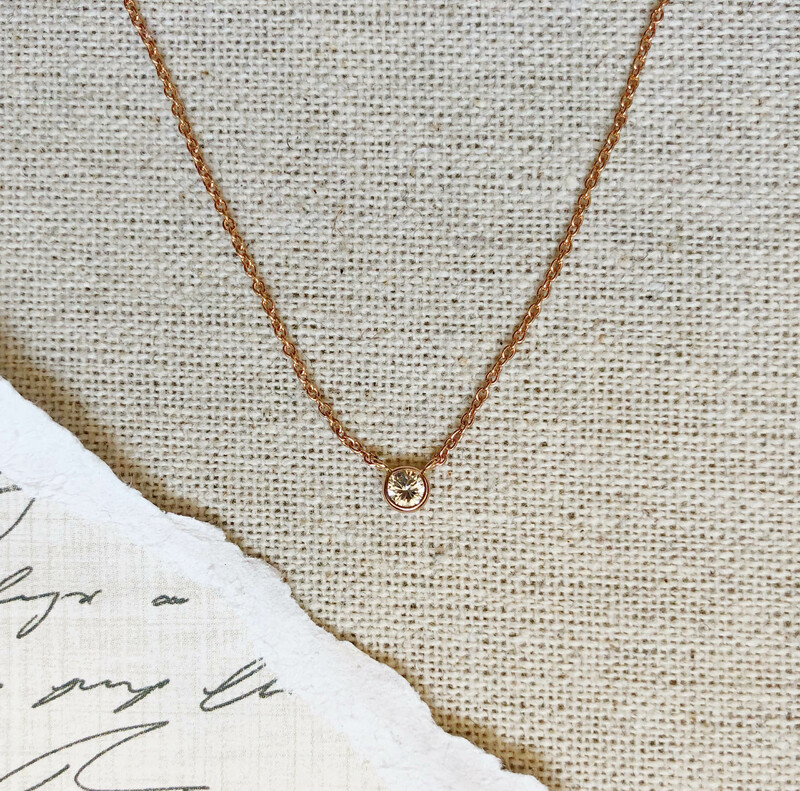 We also love this floating Marquise Diamond necklace for a very delicate look that still packs on the sparkle. 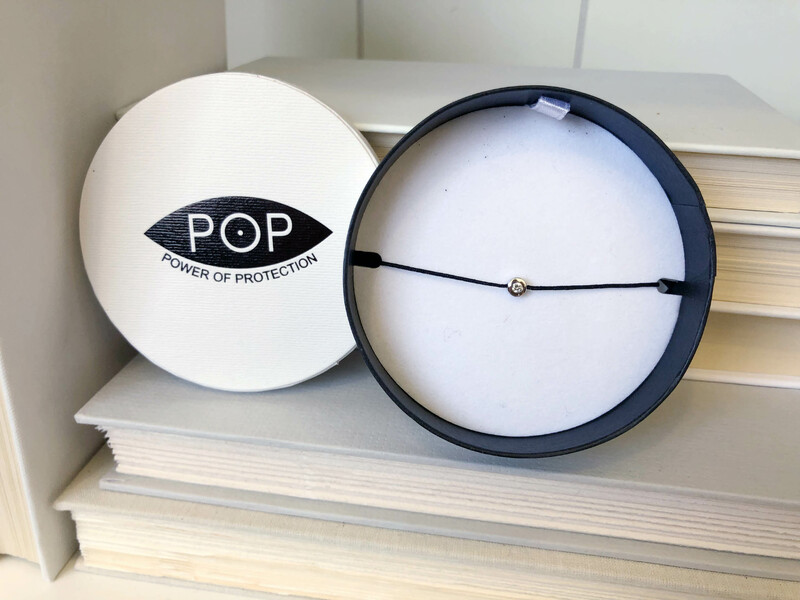 For the more active mom, the POP Diamond bracelet would make a wonderful gift. 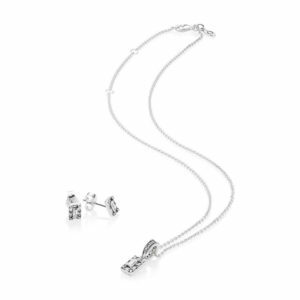 A 0.10ct diamond is set in sterling silver on a nylon cord, making this a great choice for the mom on the go. 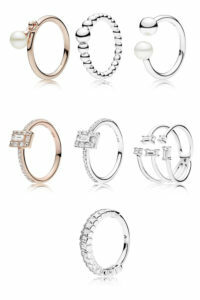 Interested in looking at more of our fine jewelry selections? You can browse some more of our selection here. 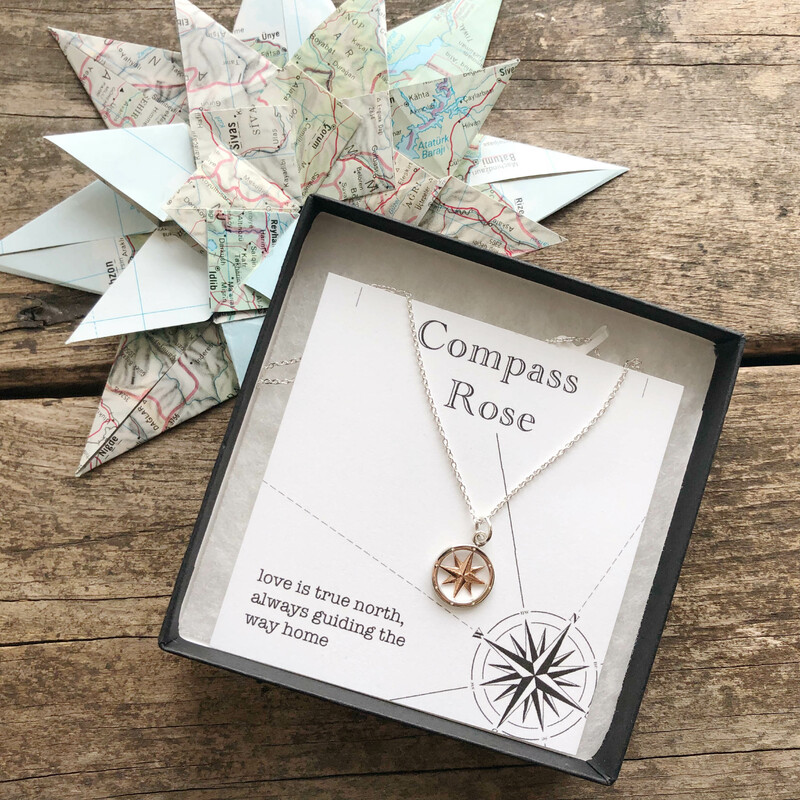 We love our Compass Rose collection for almost any occasion, but it is particularly fitting for Mother’s Day. 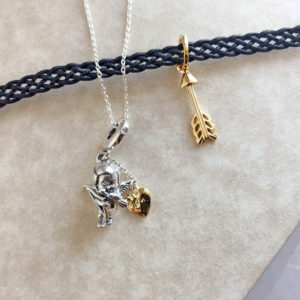 The symbol of the compass embodies the ideas of guidance and coming home. 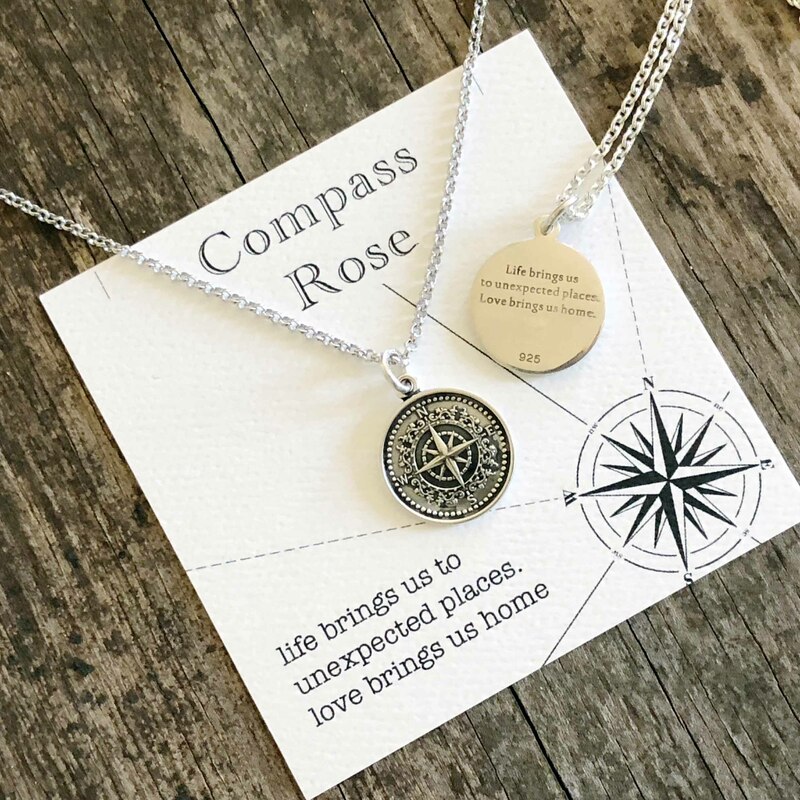 The Compass Rose tells mom that, no matter how far we may travel, our heart will always know the way back home to her. In addition to the standard Compass Rose card, we have some wonderful mom-related cards that you can choose from. 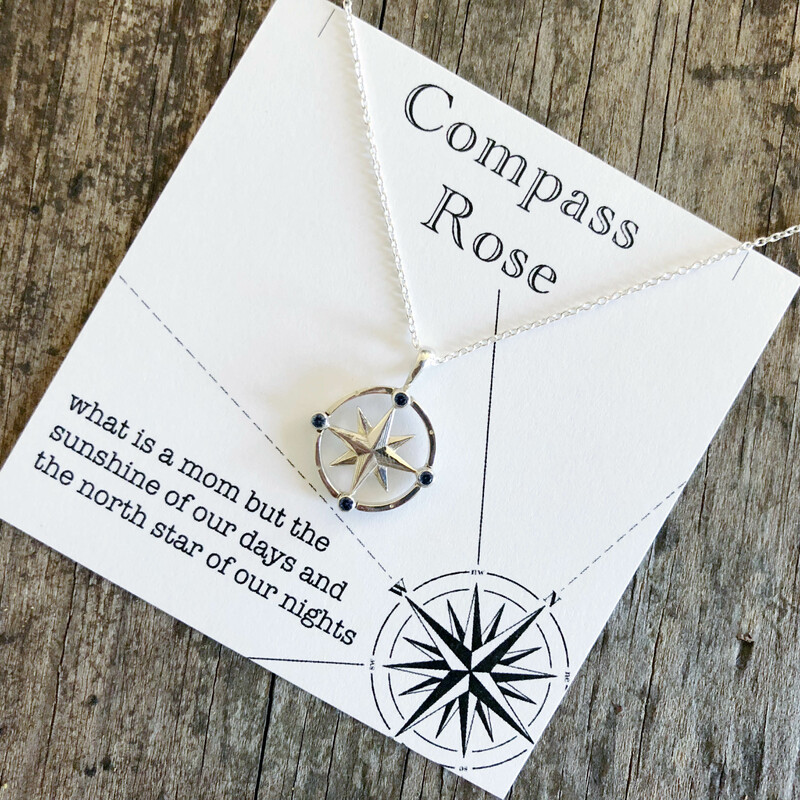 Do you think that the Compass Rose might be the perfect gift for mom? You can see more styles here. Is mom the guardian angel of your family? 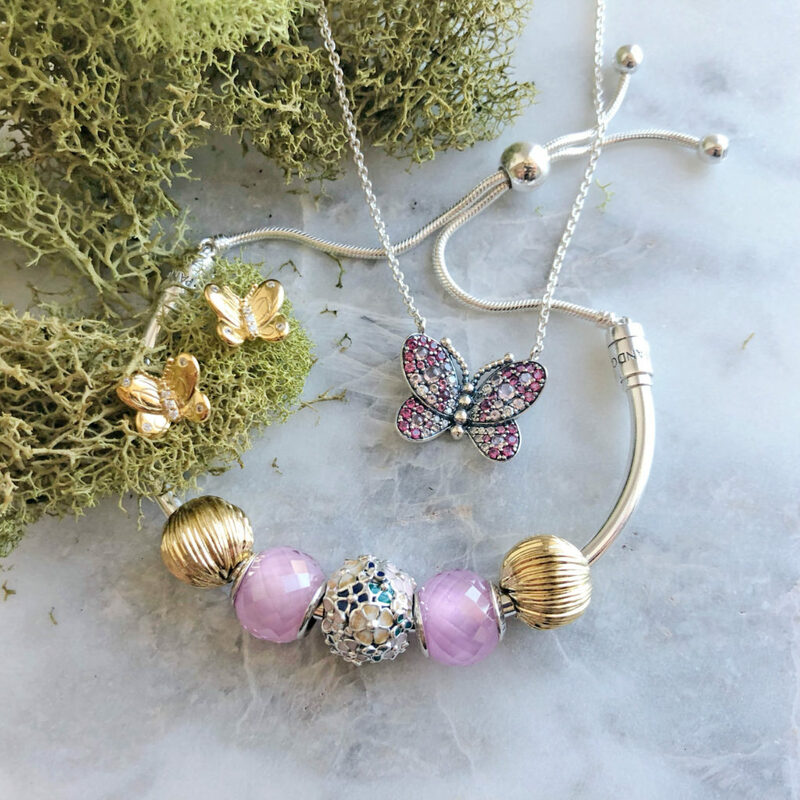 Show your appreciation with a beautiful Thortiuda necklace! Thortiuda, Thai for angel, is also called the Angel Whisperer. 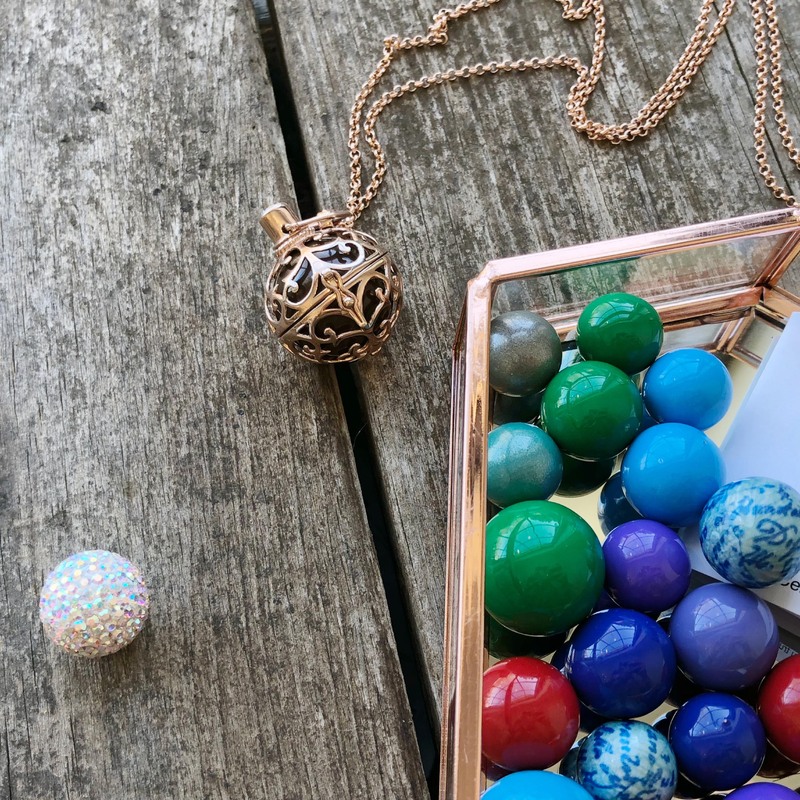 Each pendant opens to reveal a colored chime whose soft tone brings peace in a stressful world and is meant to call your angel to watch over you. 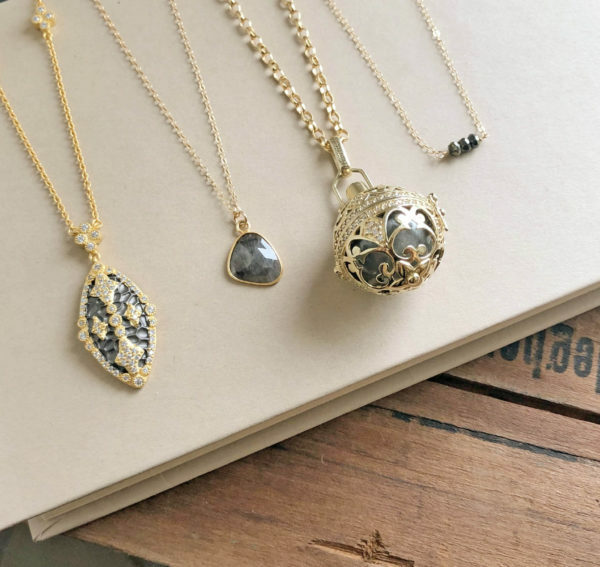 These necklaces are designed after traditional bolo necklaces worn in different cultures during pregnancy. The chime, worn over the belly, soothes the baby and brings an angel’s protection. One of our favorite parts of Thortiuda is the interchangeable chimes. Each color has its own meaning and its own sound. 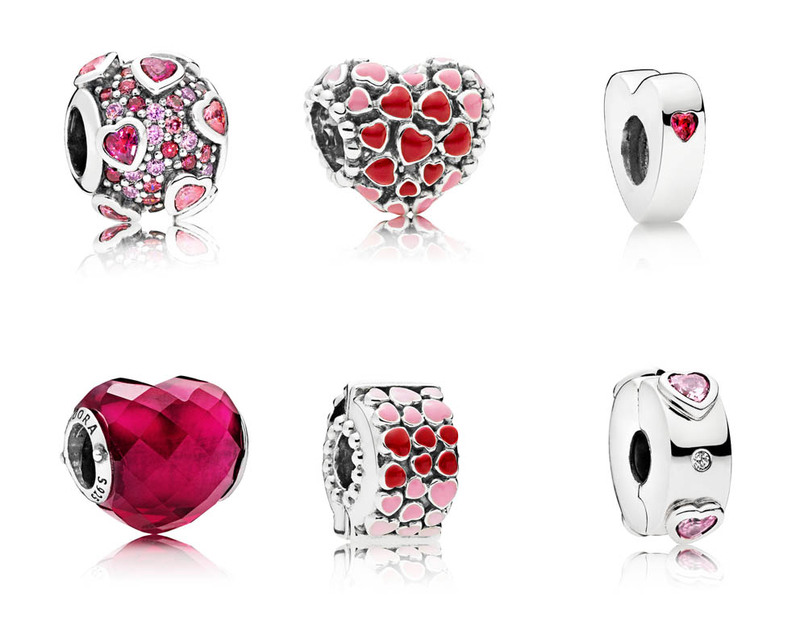 Choose a color that best reflects what mom means to you! Thortiuda pendants come in rhodium plated sterling silver, rose gold plated sterling silver, and yellow gold plated sterling silver in 3 sizes. 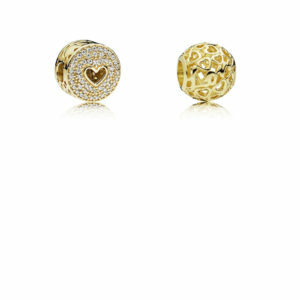 The largest sizes is also available with CZ accents for some extra bling! 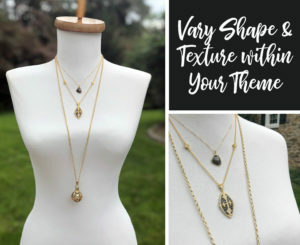 Interested in seeing more Thortiuda styles and chimes? 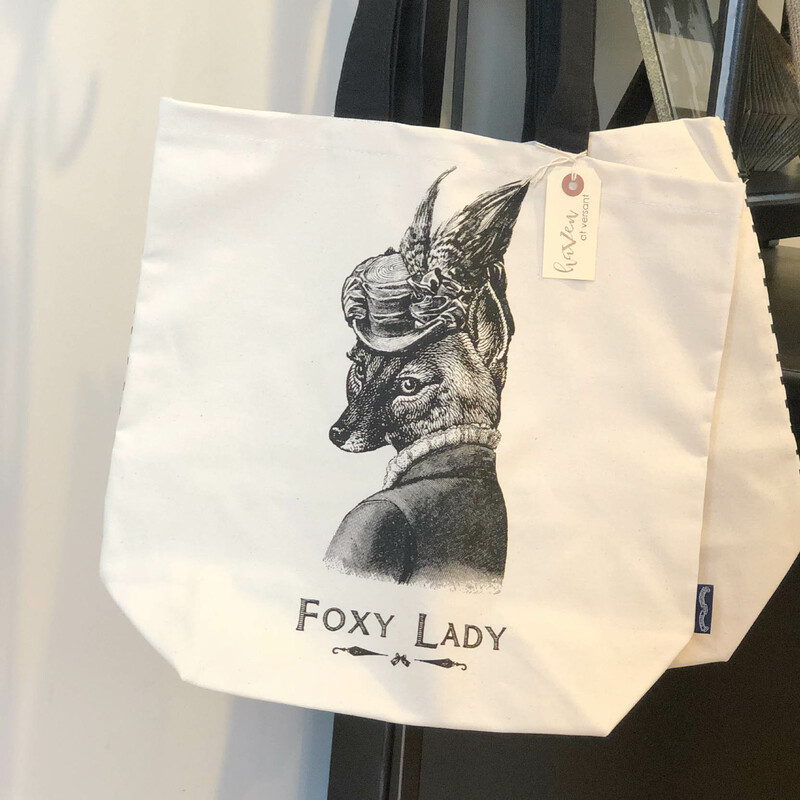 You can find our collection here. Does mom prefer to adorn her house rather than herself? Upstairs in Haven we have a lot of unique finds to make her house feel like a home! Many of our handmade canvas signs feature a quote celebrating love or family. 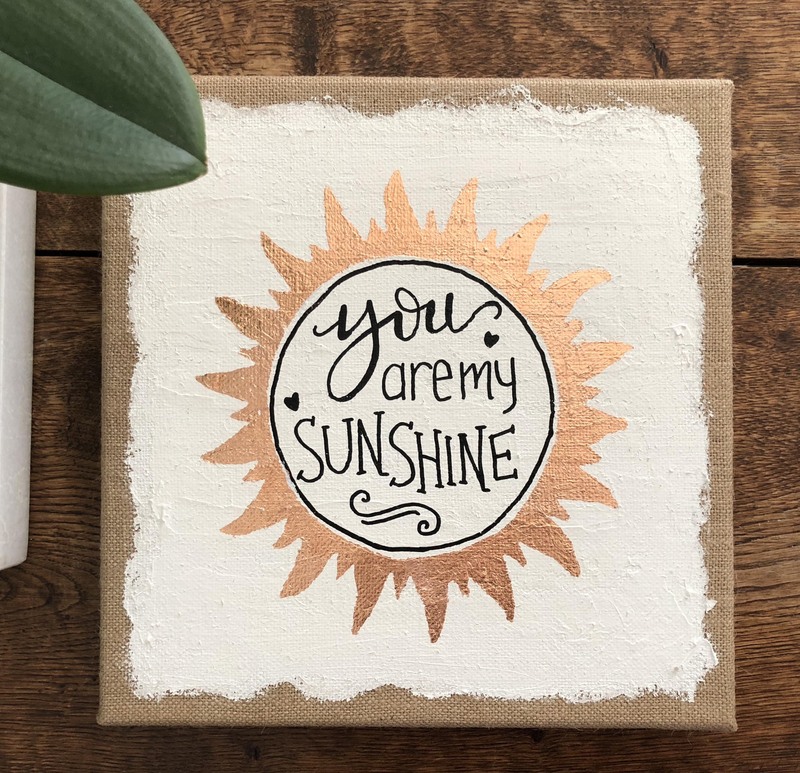 Some, like You are My Sunshine, are a great way to celebrate a special phrase shared between you and mom during your childhood. Are you celebrating a new mom or mom-to-be? 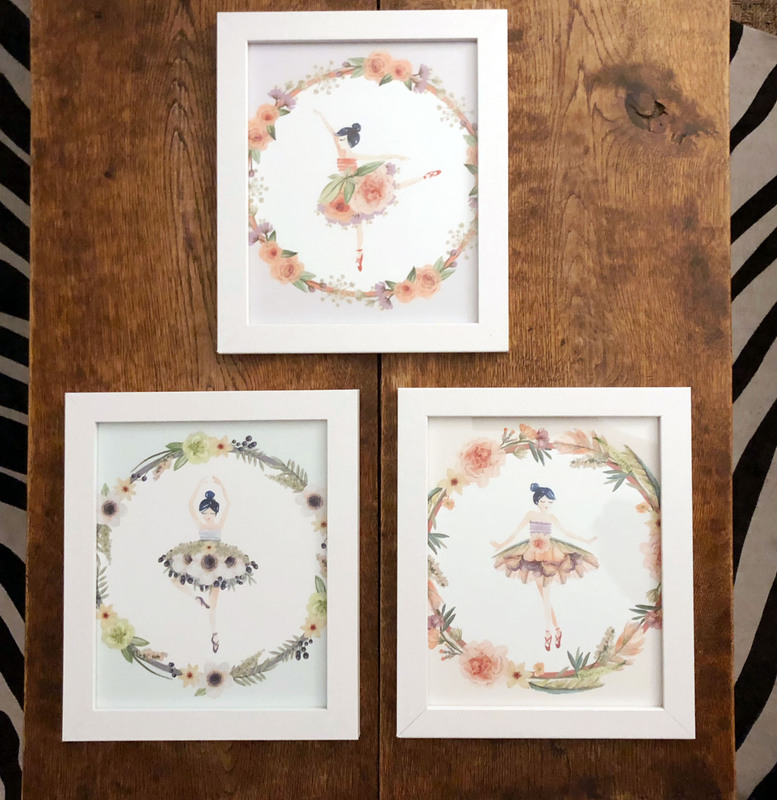 Help her decorate her nursery with some of our whimsical art prints, such as these Flower Ballerinas. If mom has strong roots in our local area, another fun gift idea is one of our local maps. 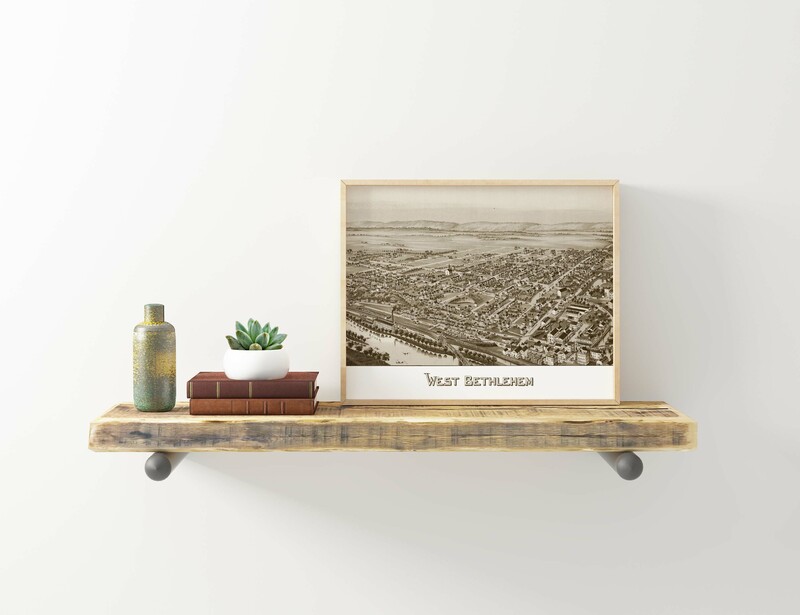 We have a wide selection of areas throughout the Lehigh Valley- search out a map that shows where your family has put down roots and where she herself grew up to make her a special set! Want to see more items from our wall art and map selection? Browse some of our print and canvas selection here. Does mom like the freedom of being able to choose her own gift? A Versant gift card might be your best option! With a gift certificate, you give her the freedom to take the time out to treat herself. This is also a great gift for those last minute shoppers! 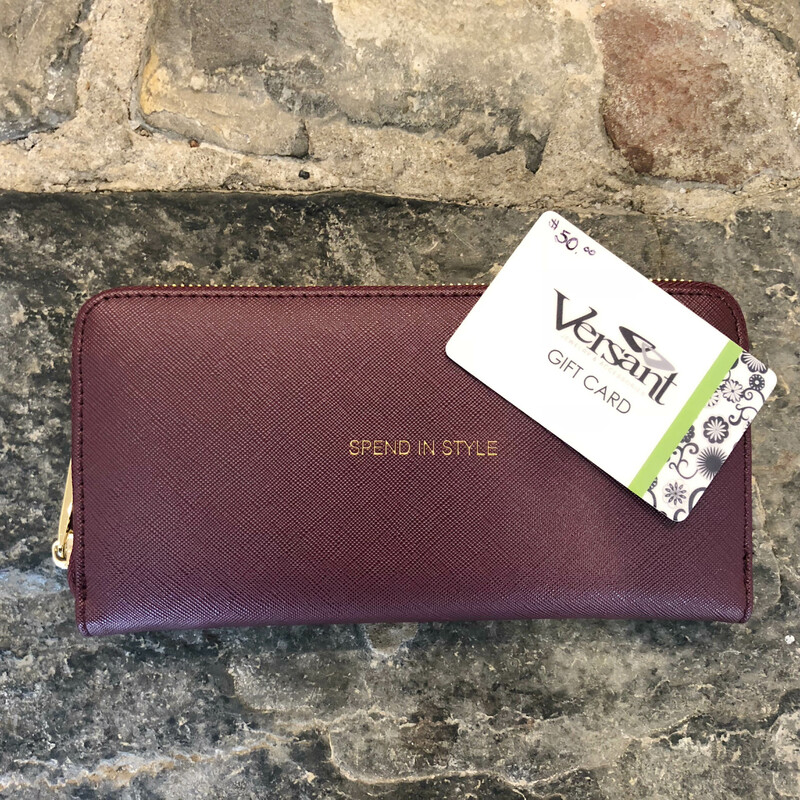 You can always purchase a Versant gift card in store, but now you can also purchase a printable Versant digital gift certificate through our online store! Digital gift certificates can be used both online and at our retail location. 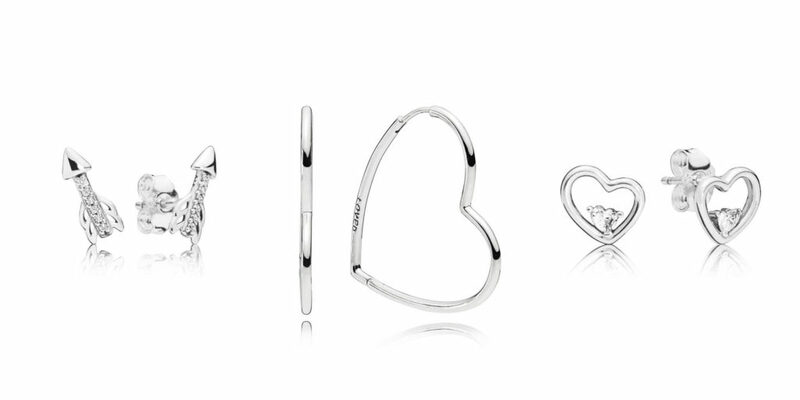 We hope you found some helpful hints in our Top Ten picks for mom this Mother’s Day! If you haven’t had the opportunity to check out our new online store, please take the chance to give it a glance! 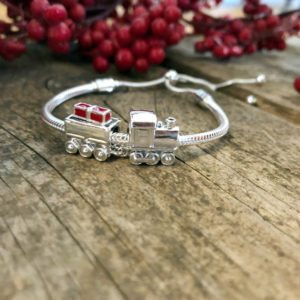 Just as we do in-store, we offer complementary gift wrapping on all jewelry items and free shipping on any jewelry purchase over $50 with the code FREESHIP50. You can also choose to pick up your items at the store by choosing “Local Pickup” as your shipping option. As always, we are very grateful to all of our customers who choose to support their local small business by shopping with us. We know you have many choices when it comes to gift giving, and we are very proud thankful that you choose to shop with our Versant family! 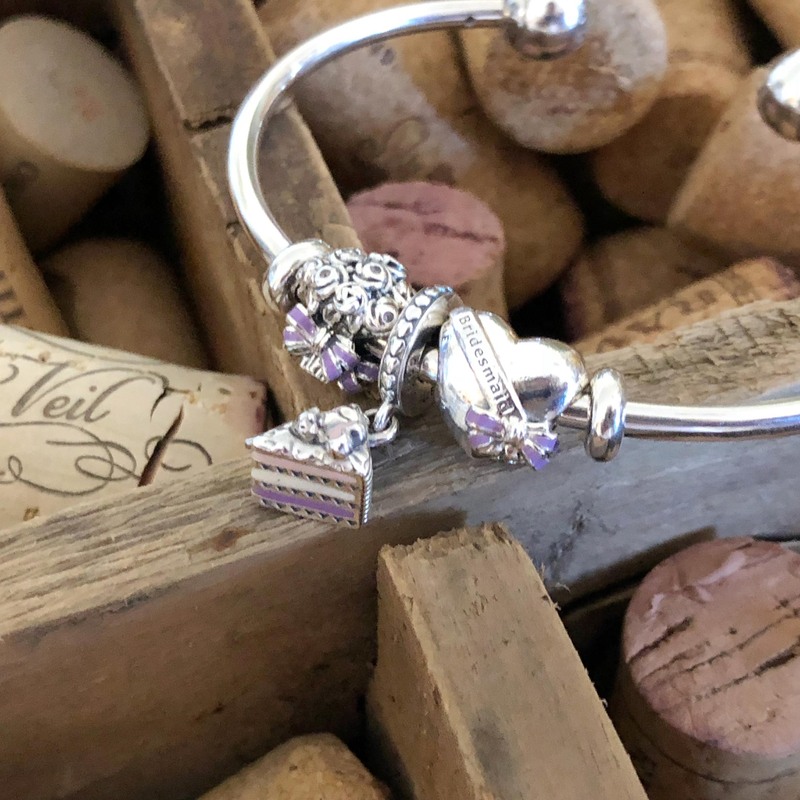 The Pandora 2018 Mother’s Day collection is here and it has added beautiful new pieces in virtually every category of Pandora! 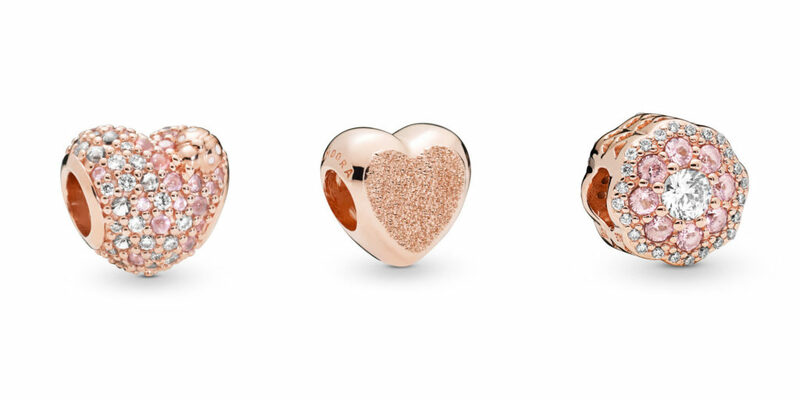 Focusing on soft pinks with hints of sparkle, the Mother’s Day collection is meant to help us celebrate the bonds of love. 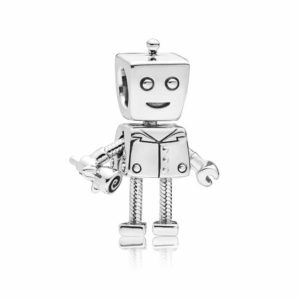 Check out our overview of all of the new pieces below! 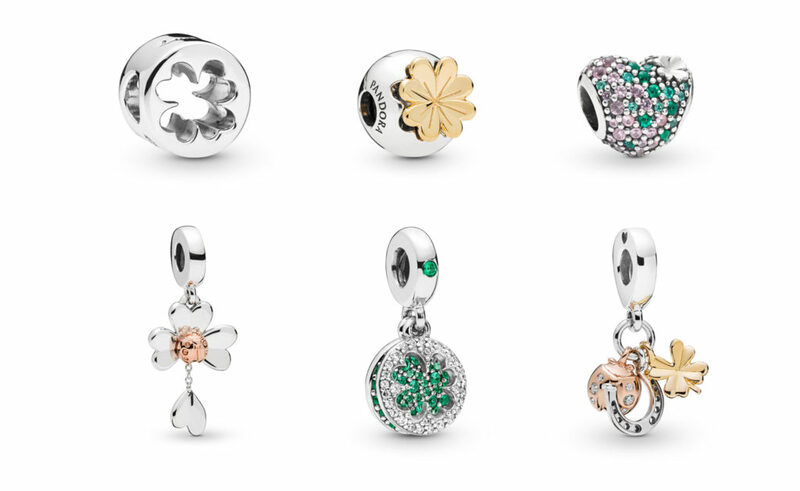 As always, the Mother’s Day collection’s main focus is charms that celebrate the family and mom’s place within it. 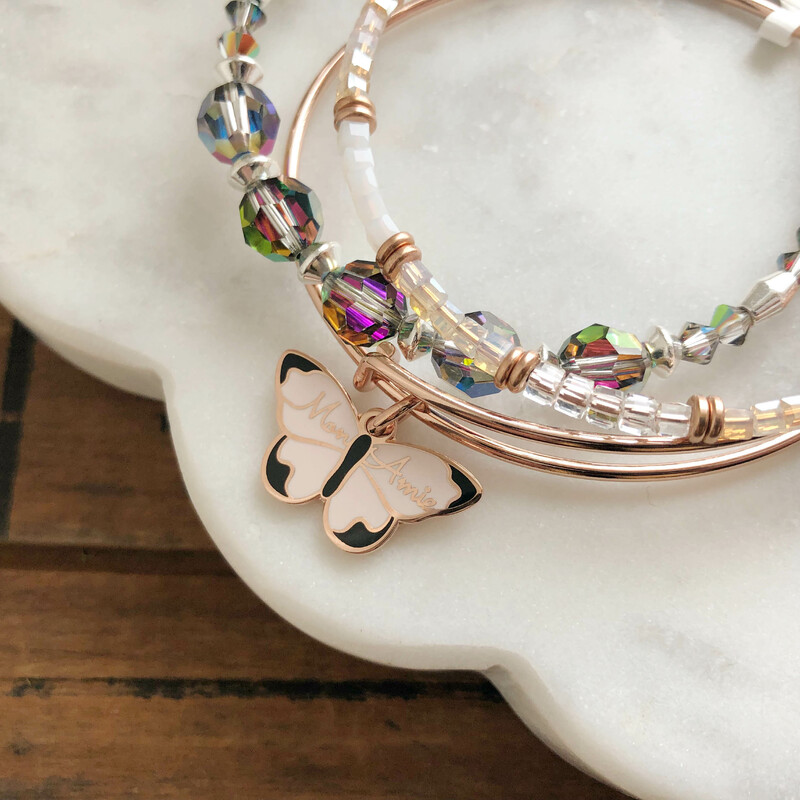 This year’s collection really goes beyond the traditional “mom” charms- we love the unique ways the new designers have found to honor mom! 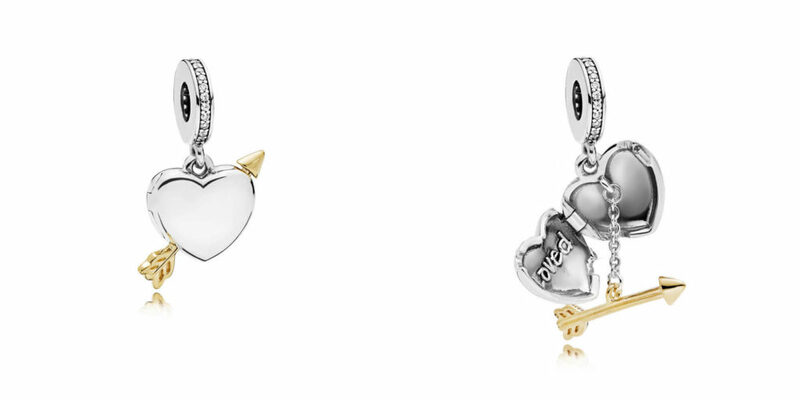 Two of our new favorite charms are the Mother and Baby Bird dangle and the Perfect Home dangle. 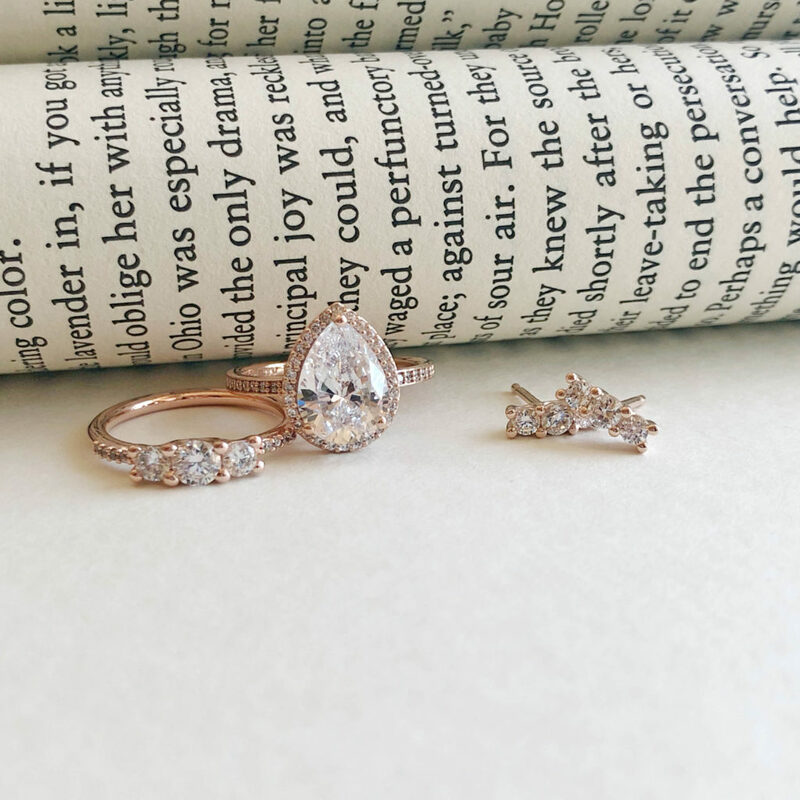 The birds are such a sweet representation of a mother and child relationship and have a beautiful ombre effect in the sparkling stones that surround the birds. 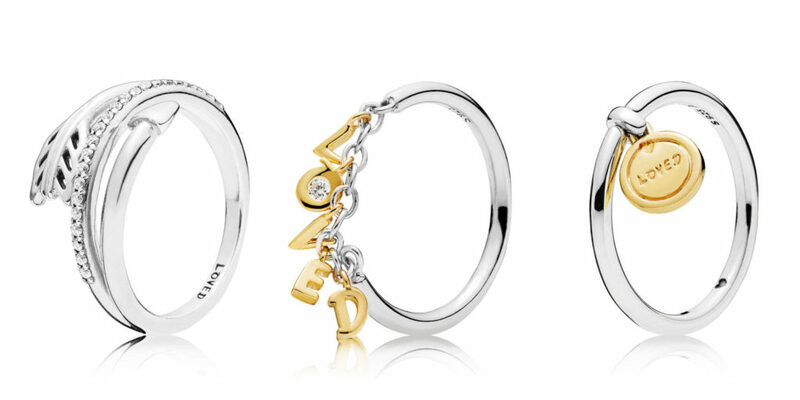 Another one of our new favorite charms is the Degrees of Love charm. 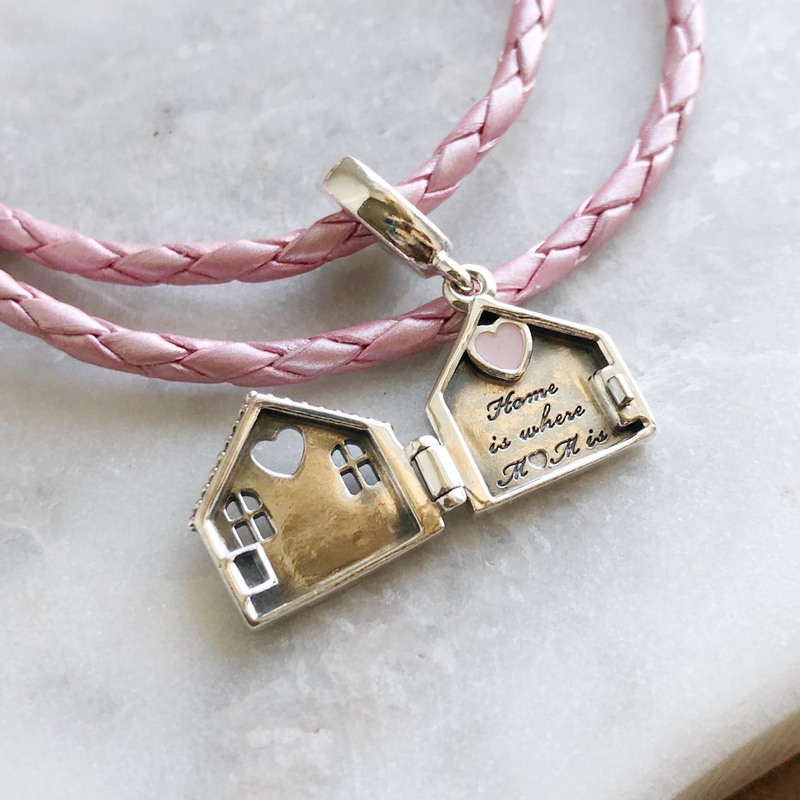 With a soft enamel that blends from pink to lavender, one side says “❤ you more” and the other says “❤ you most”. 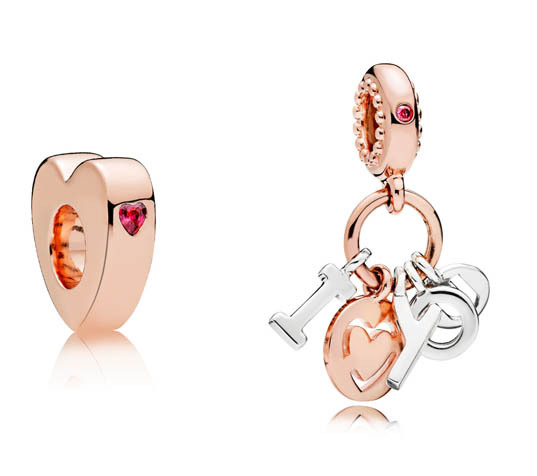 We love that this charm celebrates our love for mom but still has a beautiful abstract look! 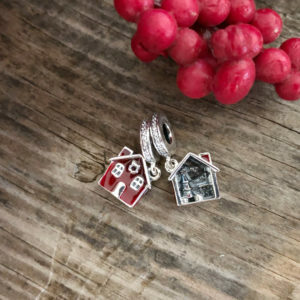 The new enamel Love Mom charm is also a very pretty complement to the colors of the season and is a great look for those moms who prefer the silver and enamel charms to those with pavé stones. 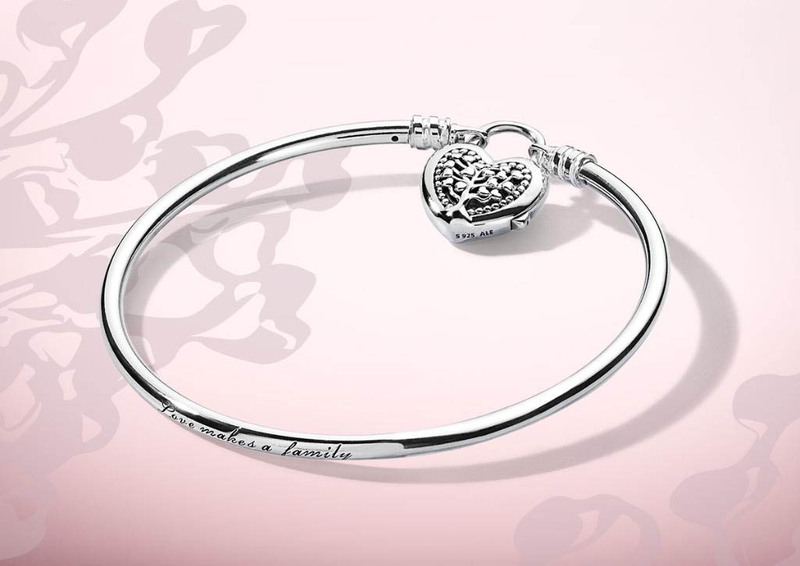 We also love the new engraved “Mama Bear” charm to celebrate how fierce our mother’s love can be! 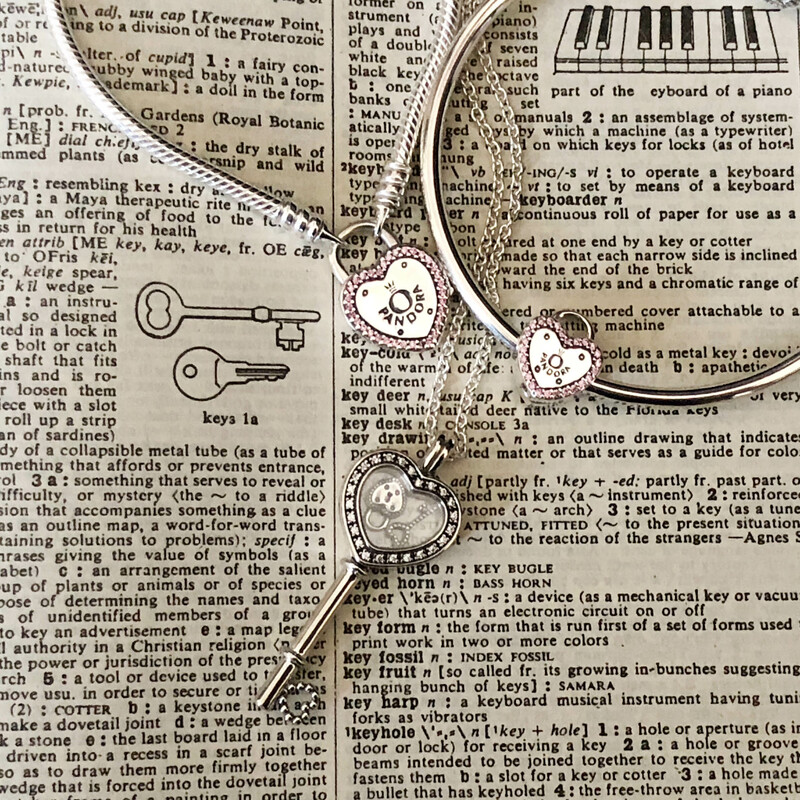 Rounding out the family themed charms are some beautiful new family tree charms, mom and harmonious hearts dangles, whimsical balloon animals, and a new murano glass charm with glitter pink in the interior. 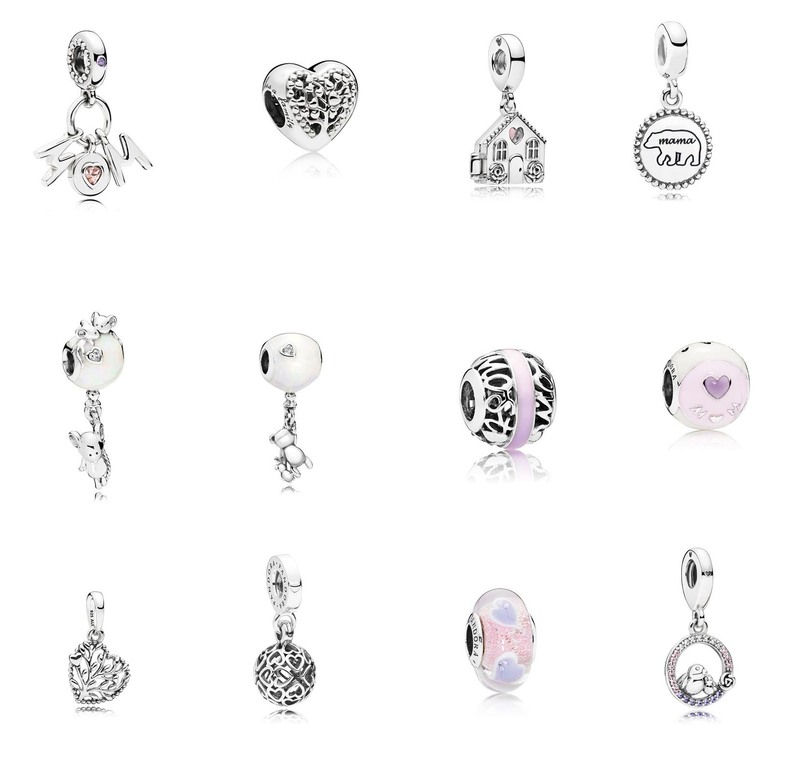 The Bonds of Love themed charms feature a bow motif and, in addition to two new clips and a heart bow charm, include a new “statement charm” that is much larger than the traditional Pandora charms. 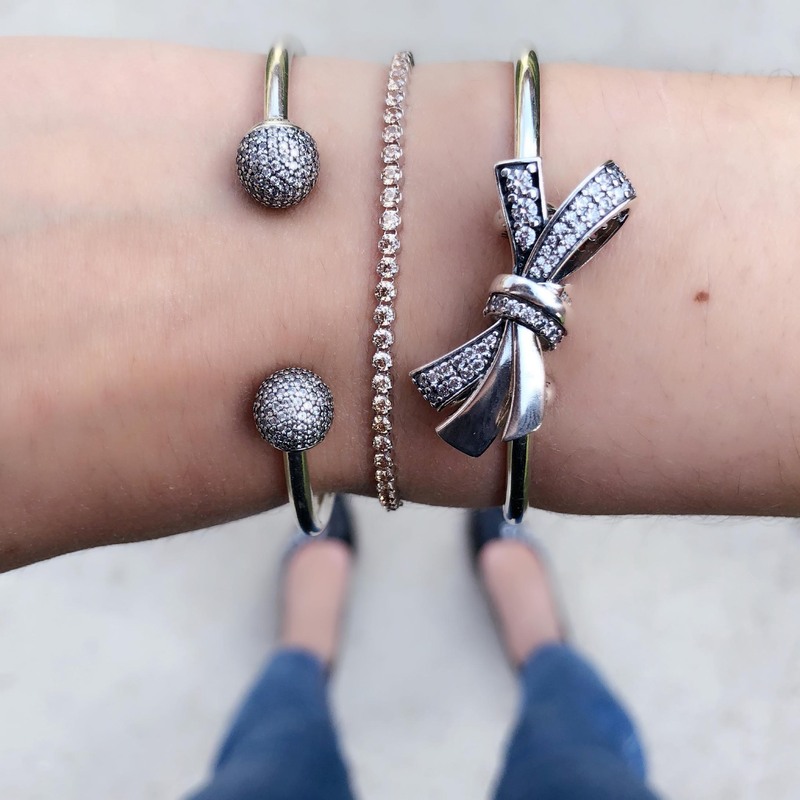 We love the way the Brilliant Bow looks styled by itself on an open bangle! 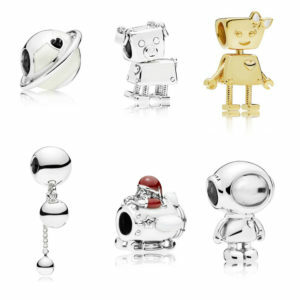 In addition to the family themed charms, this year’s Mother’s Day Collection includes some fun new celebration charms! 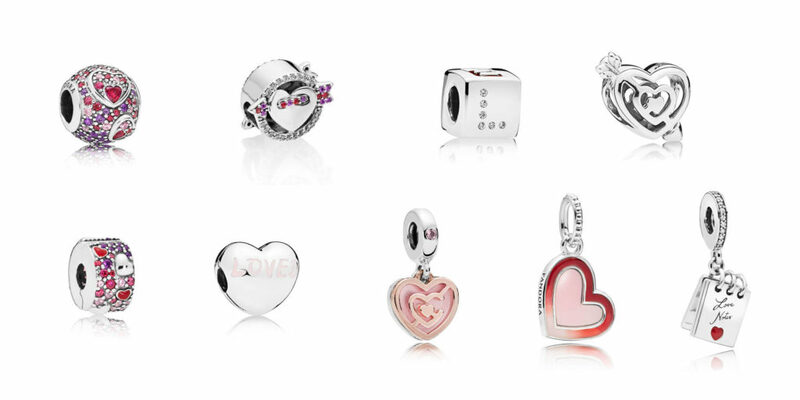 These range from milestone birthdays and achievements to bridal themed charms. 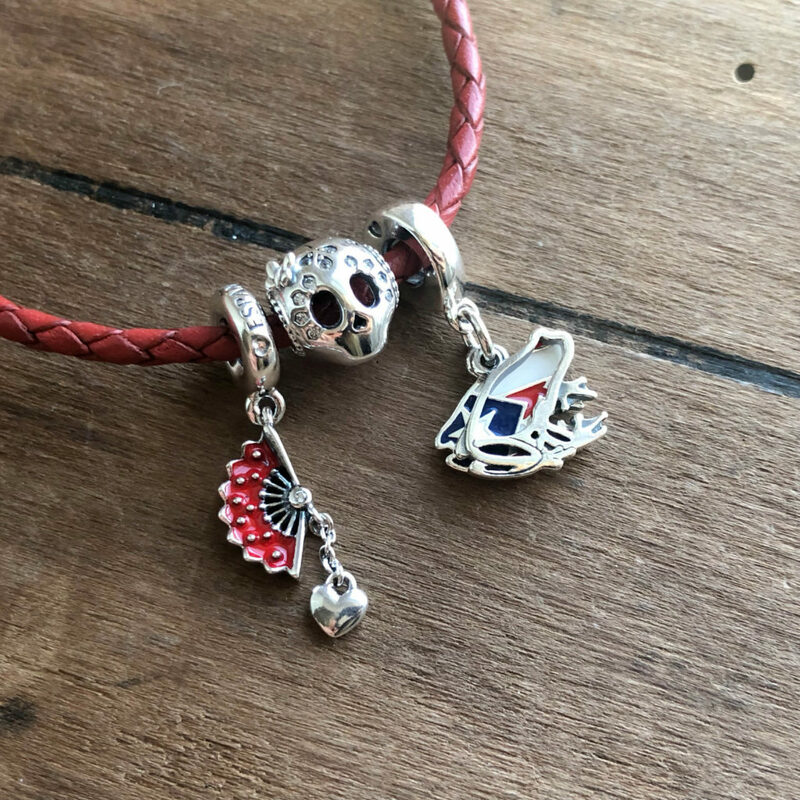 We think the new Celebration Cake charm, with it’s multicolored enamel icing and “Congrats” tag, is particularly adorable. 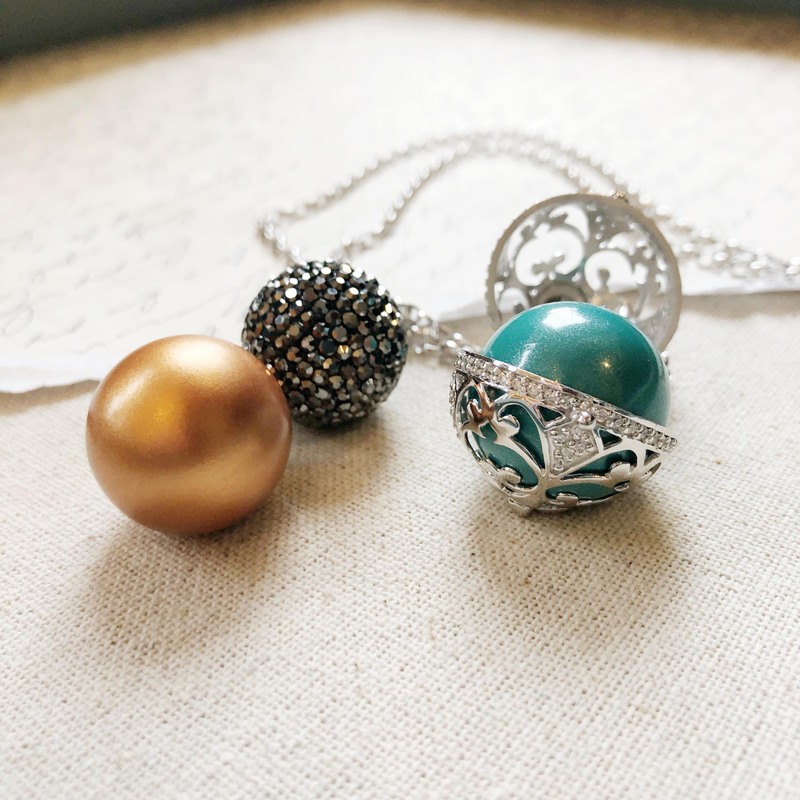 The Celebration Bouquet and Best Bridesmaid charms are a great way to ask your friends to be a part of your bridal party or commemorate the day! 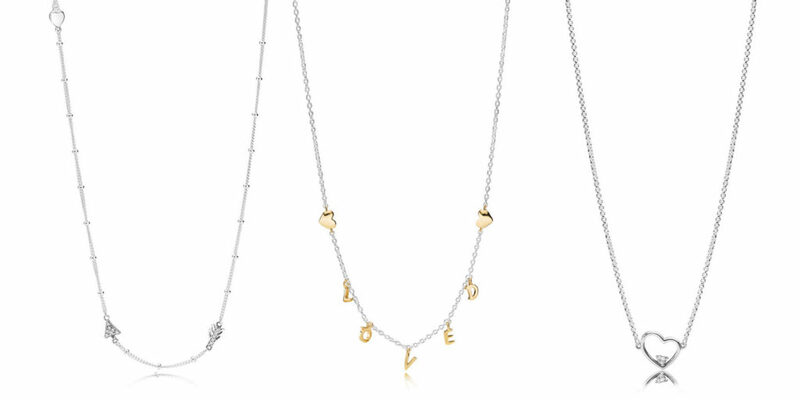 Other additions include a love themed safety chain, a Love Couple trio that includes a mustache, “Mr & Mrs.” heart charm, and pink lips, a 2018 graduation scroll, milestone age or anniversary charms, and an Achievement trophy. 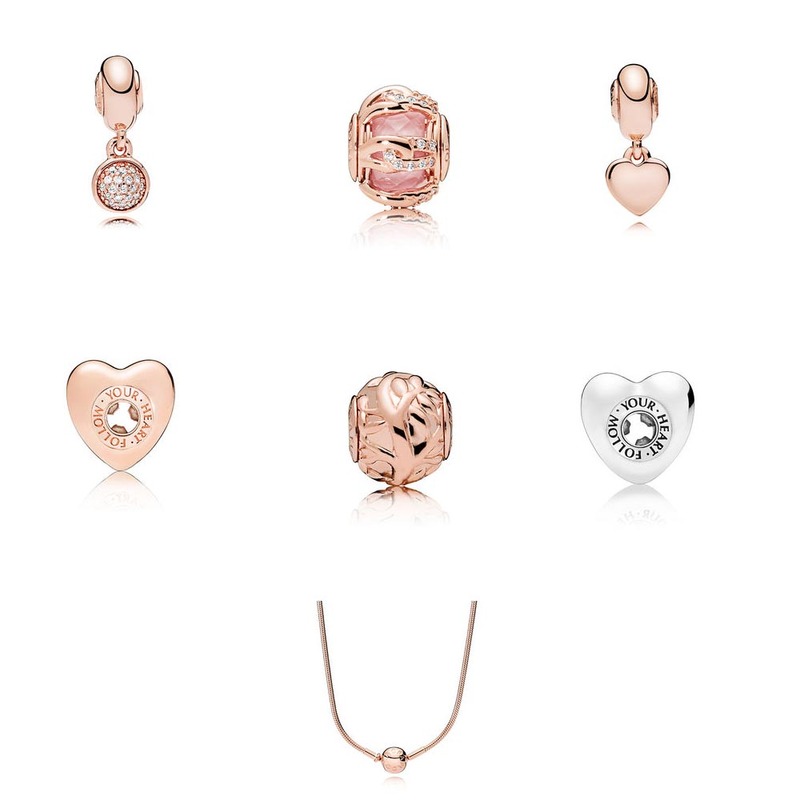 The 2018 Mother’s Day Collection is a big step forwards for Pandora Rose lovers! 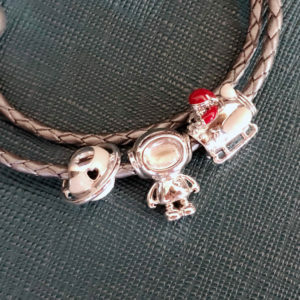 There are a lot of new additions in the charms category, including both new designs and some of our favorite silver designs redesigned in Pandora Rose. 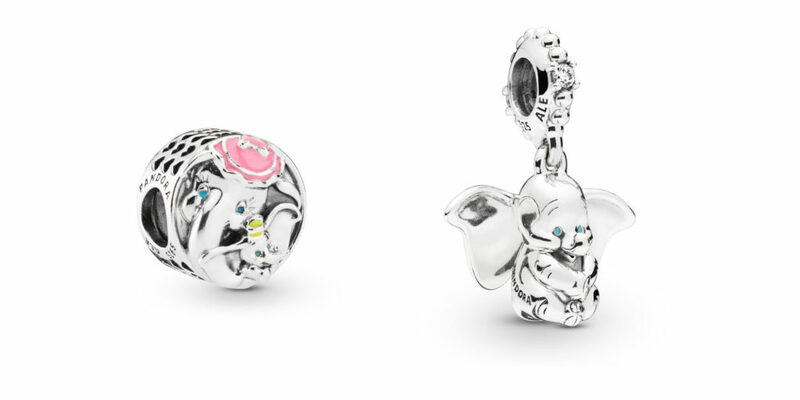 One of our favorite Pandora Rose charms is the Mother & Daughter set of 2. 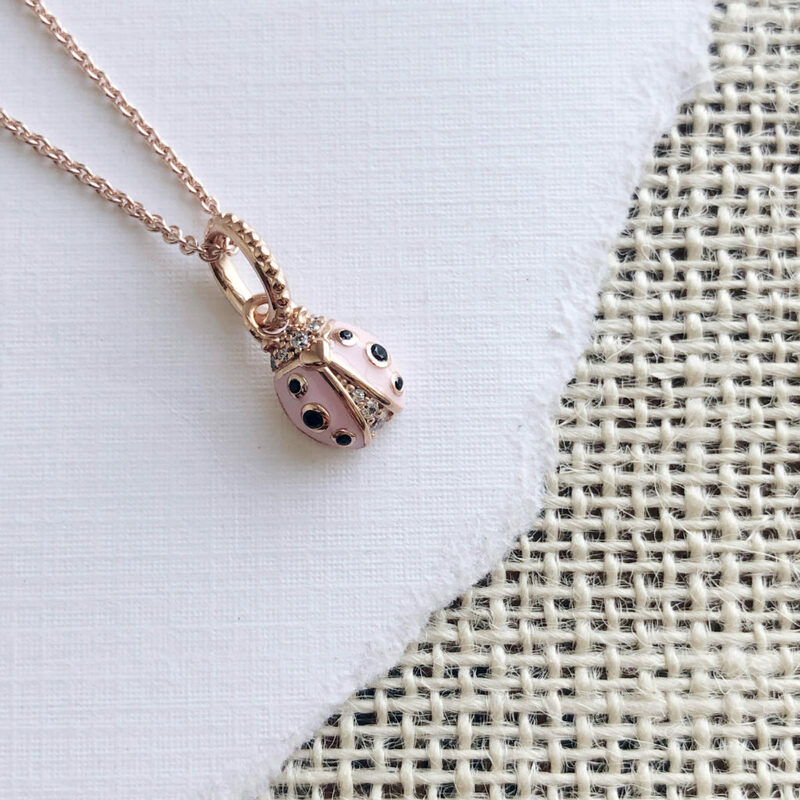 We love the combination of the Pandora Rose with the cream enamel. 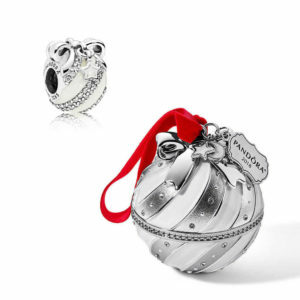 This is a great gift for daughters with Pandora to give because it includes a gift for yourself as well! 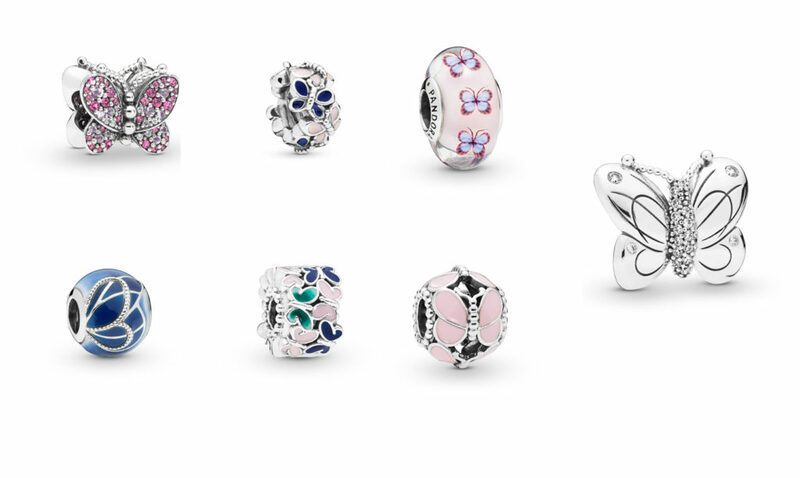 In the new Pandora Rose charms. the Hearts Filigree, Pattern of Love, Part of My Heart, and Harmonious Hearts Pacifier are all designs available only in the Rose. We particularly like the Patterns of Love, which has “Love Makes a Family” engraved on the back and a pretty lattice design on the front. 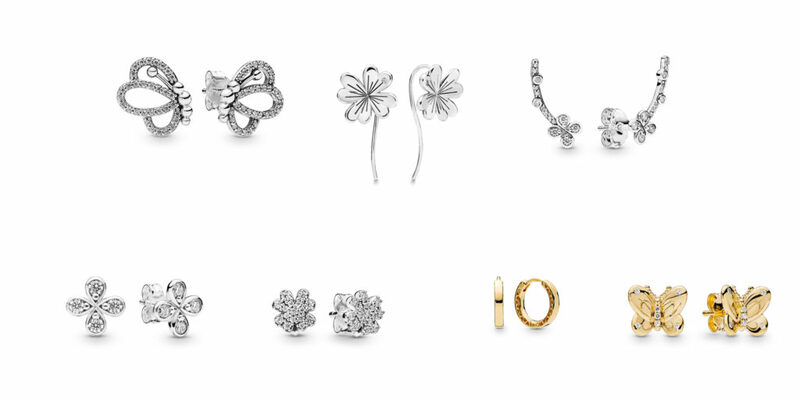 Pandora always includes some great value gift sets in their Mother’s Day Collection. This year’s sets are a real treat with a great variety of stylings! 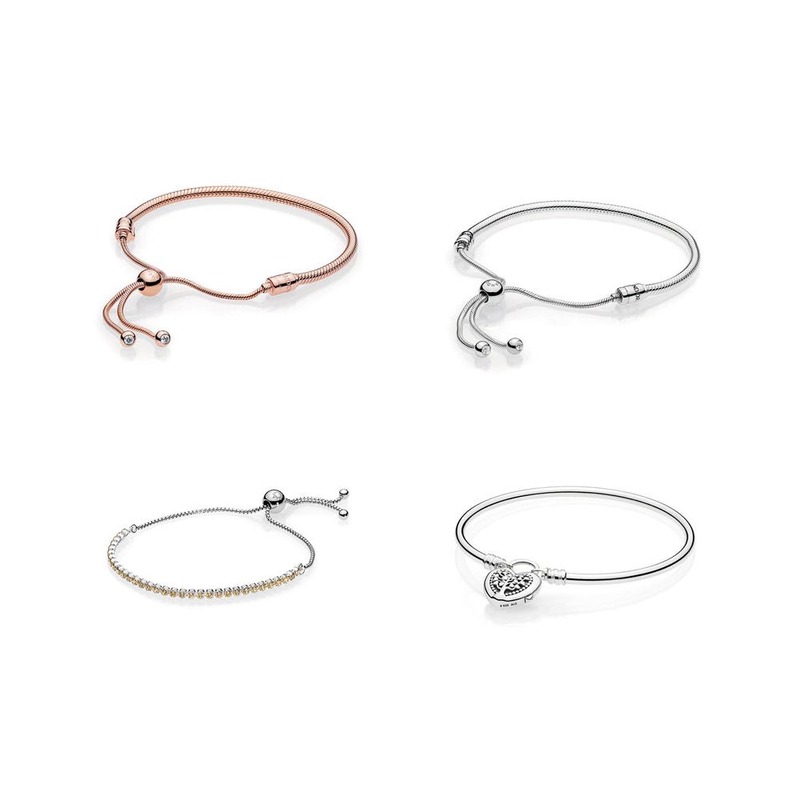 The Perfect Mom bangle set is a wonderful gift for the silver loving mom. 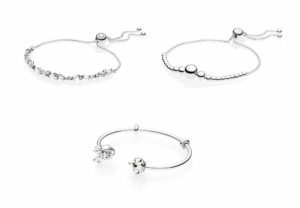 Add a new bangle to stack on with her existing bracelets or start off her collection with this set! 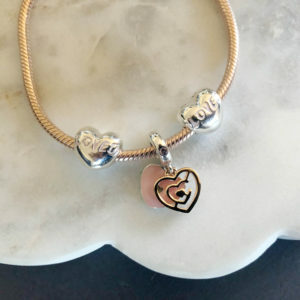 It includes the Heart Bangle and the Perfect Mom charm. At $99, it represents a 14% savings over the normal retail price of $115 and comes in the special Mother’s Day limited edition box. 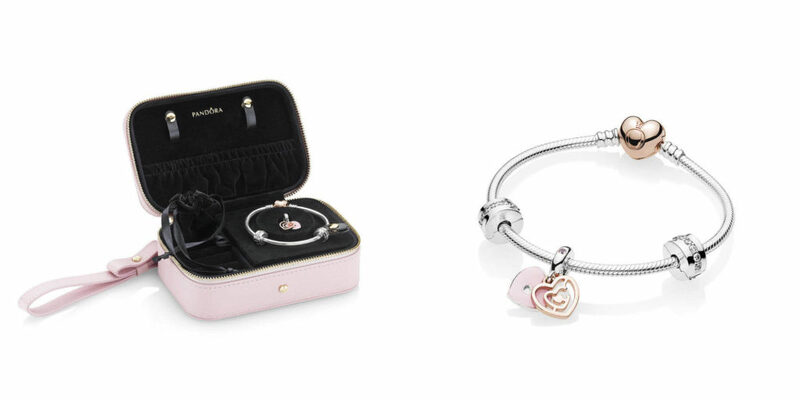 The In My Heart gift set is a great introduction for the mom who wants to start collecting Pandora Rose. 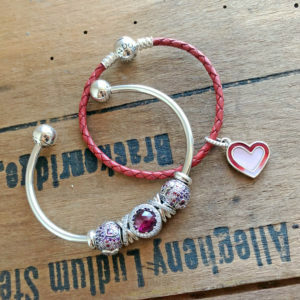 This set includes the Rose Heart clasp bracelet, two Rose Shining Path clips, and the new In My Heart two-tone charm. At $229, it represents a 10% savings over the normal retail price of $255 and comes in the special Mother’s Day limited edition box. 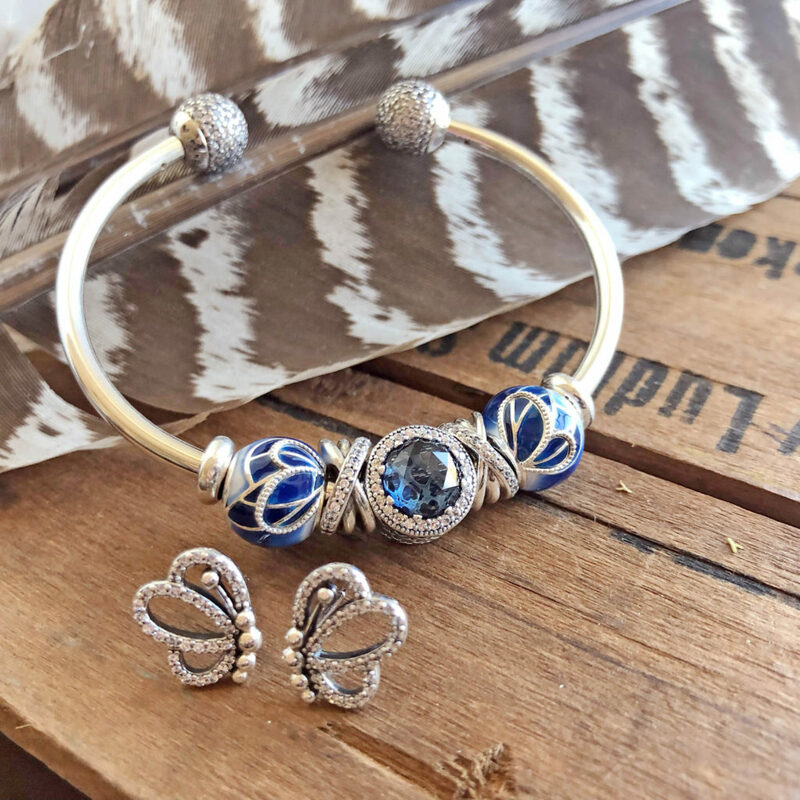 The Flourishing Hearts gift set is great for the mom who has been branching out into Pandora’s beautiful jewelry options beyond their charm offerings. 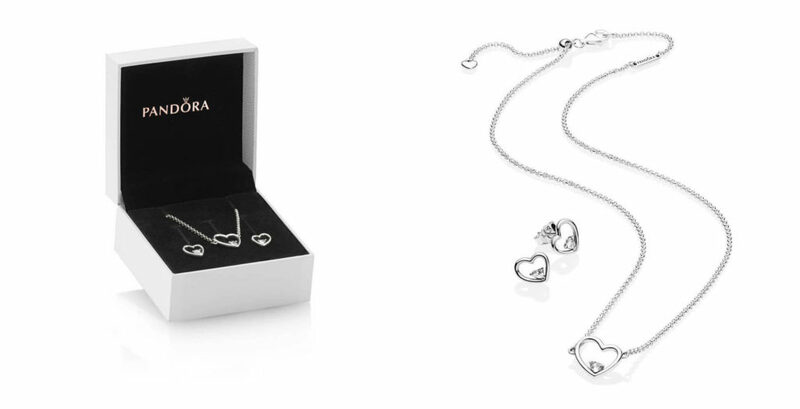 The set includes the Flourishing Hearts stud earrings and Flourishing Hearts dangle charm on Pandora sterling 45cm chain. 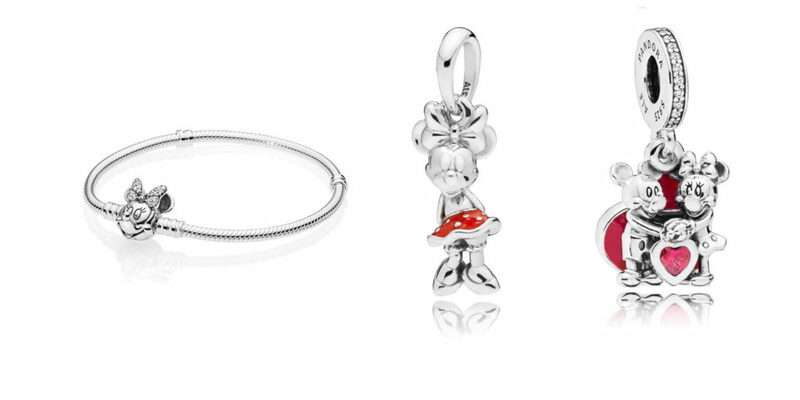 The charm can be worn on the chain or added to her Pandora bracelet! At $99, it represents a 17.5% savings over the normal retail price of $255 and comes in the special Mother’s Day limited edition box. 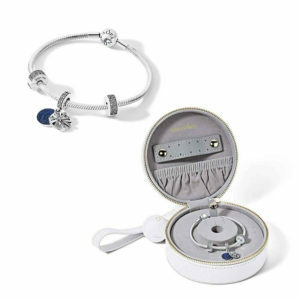 The Sparkling Mom gift set brings mom into the innovative world of Pandora’s memory lockets. 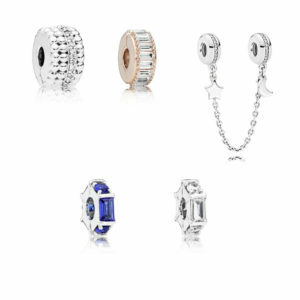 Made with sapphire crystal, like luxury watches, to deter scratching of the clear surface, these lockets let you make beautiful vignettes with Pandora petite charms. 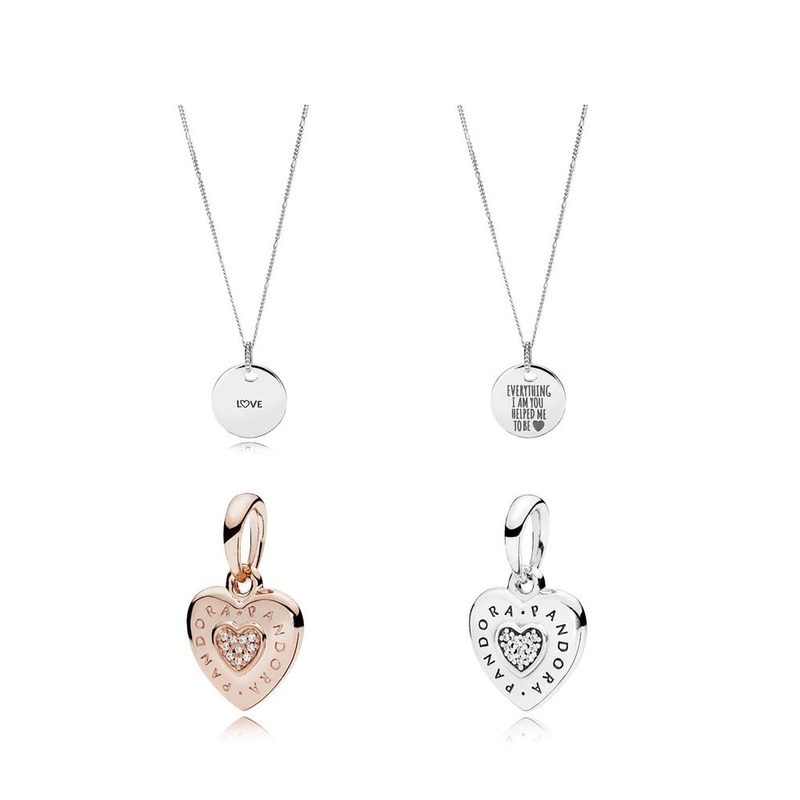 The locket included in this set is reversible- you can wear it with the sparkling pavé side or the smooth silver side facing up. 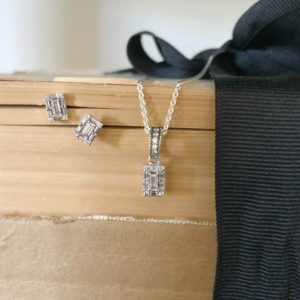 It includes three of the new letter charms spelling out “mom.” At $129, it represents a 24% savings over the normal retail price of $255 and comes in the special Mother’s Day limited edition box. 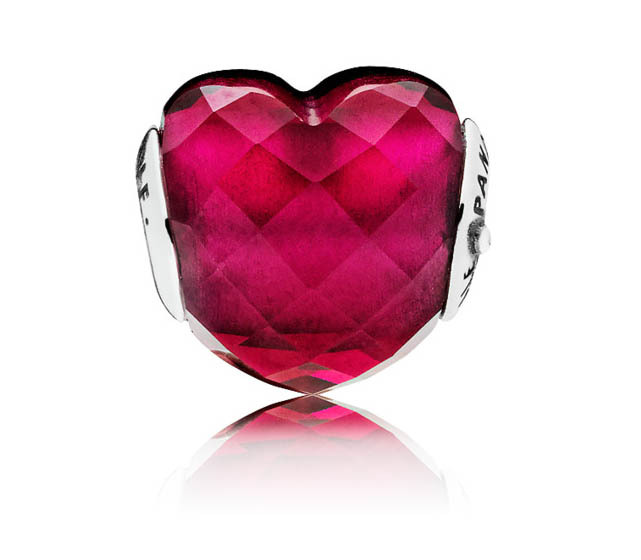 The last special addition this year is the Flourishing Hearts Limited Edition locket bangle. 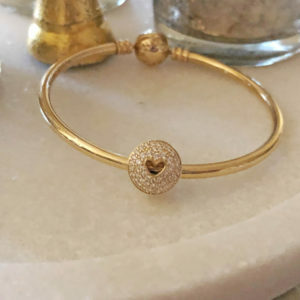 This bangle has the new locket-style clasp with the Flourishing Hearts motif and is engraved “Love makes a family” on the bangle. 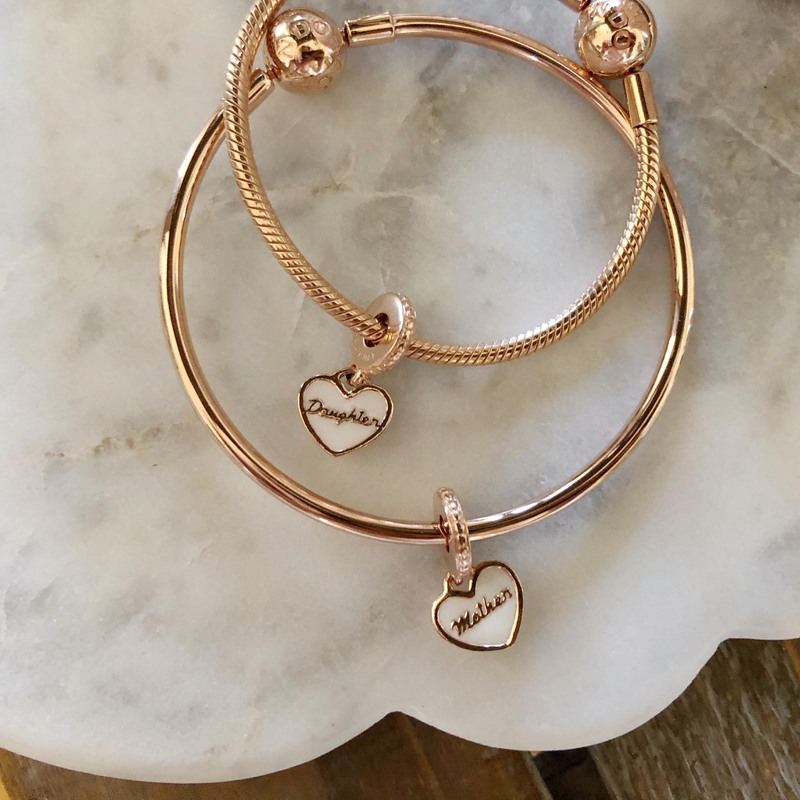 You can add charms to the bangle, but we think this bangle would also be beautiful standing by itself stacked with mom’s other bracelets! This is a Limited Edition offering and is $75. 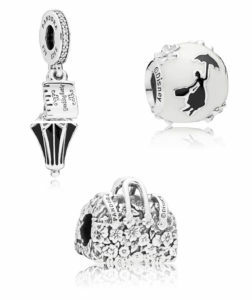 With the Mother’s Day Collection, a small group of new jewelry items beyond the charms has been released as well. 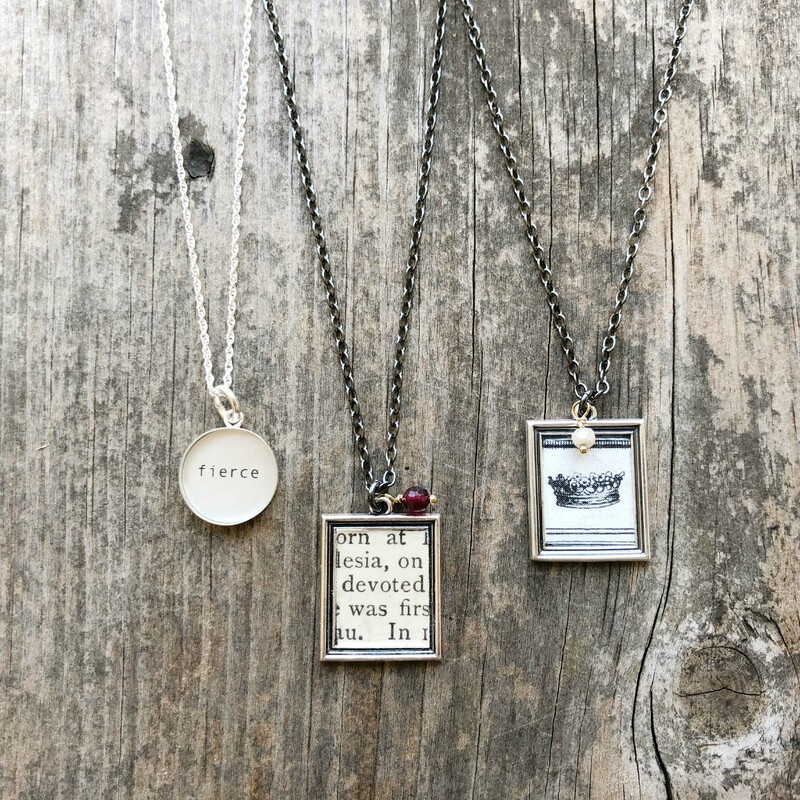 One of our favorite new additions is the new Alphabet petites ($10) for the Memory Lockets. 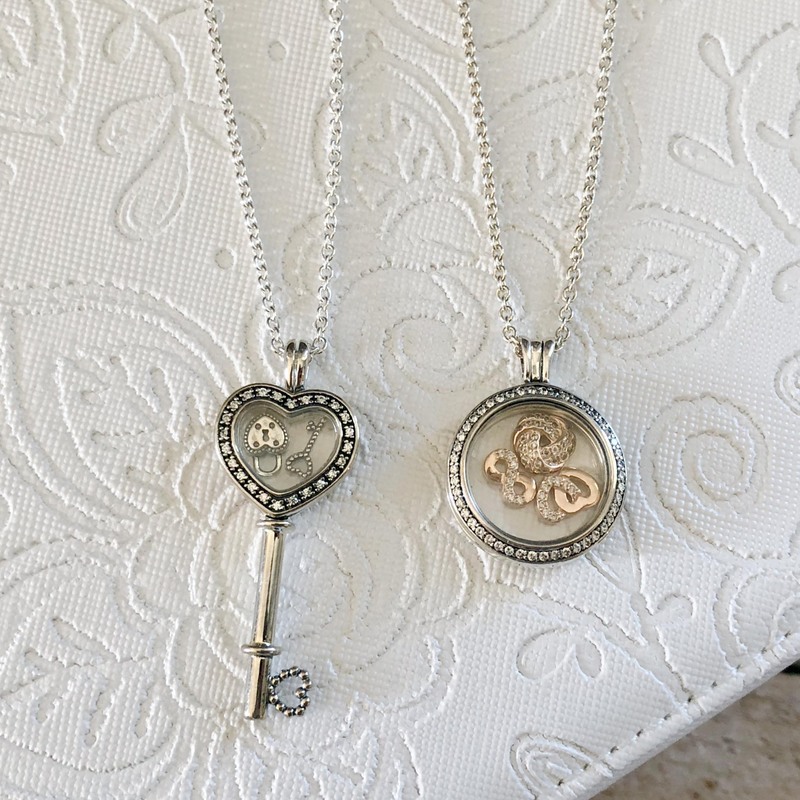 These new initials are reversible- one side is a smooth silver and the other has a pretty texture studded with hearts and small dots. 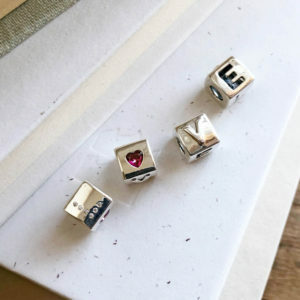 Mix initials and birthstones to make a representation of your family! 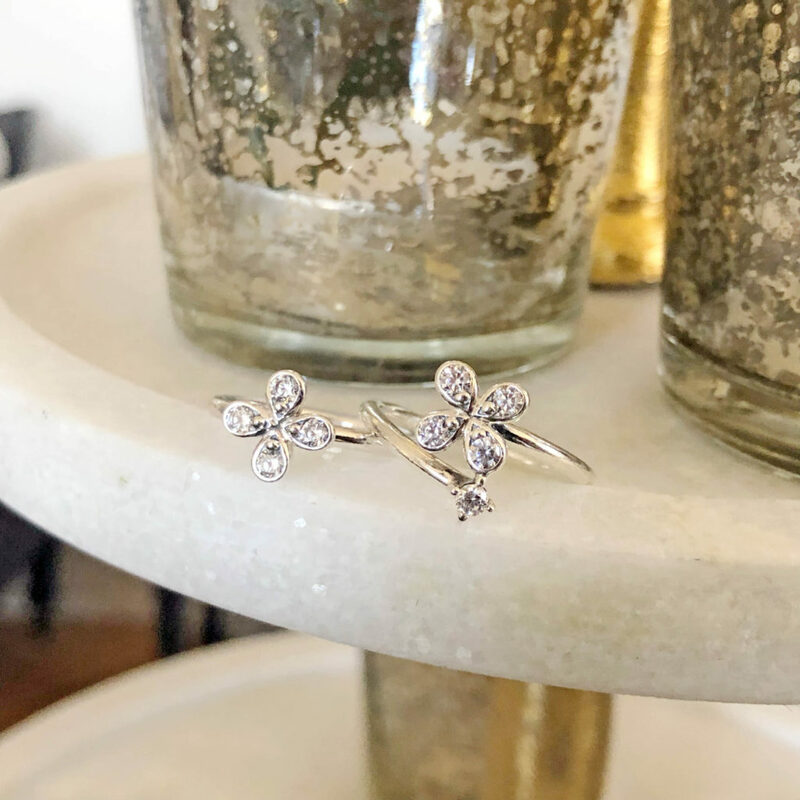 We love the new Brilliant Bow earrings ($60)- more abstract (and mature) than the existing bow earrings, the long line of these is really pretty when you wear them as an ear climber. 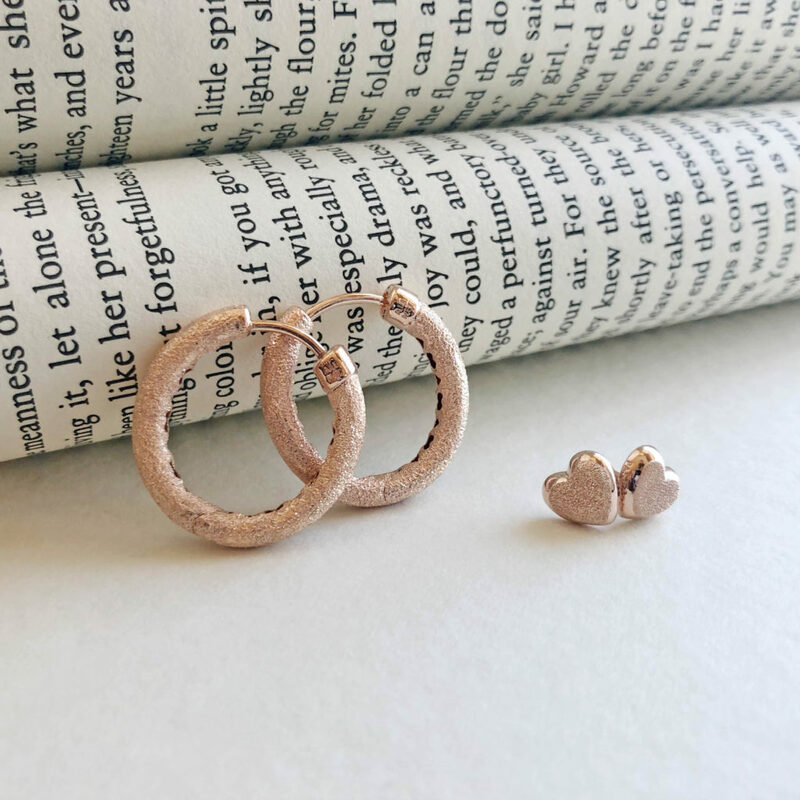 Other earring additions include new small hoop-style abstract heart earrings in both silver and Pandora Rose, Flourishing Heart studs, heart studs with a soft pink enamel. 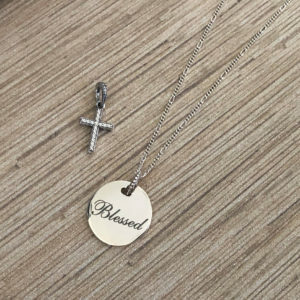 In new necklaces, there are two disc-style engraved necklaces ($75). 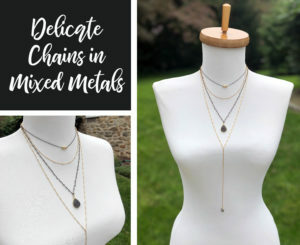 These are a longer length and would make great layering pieces. 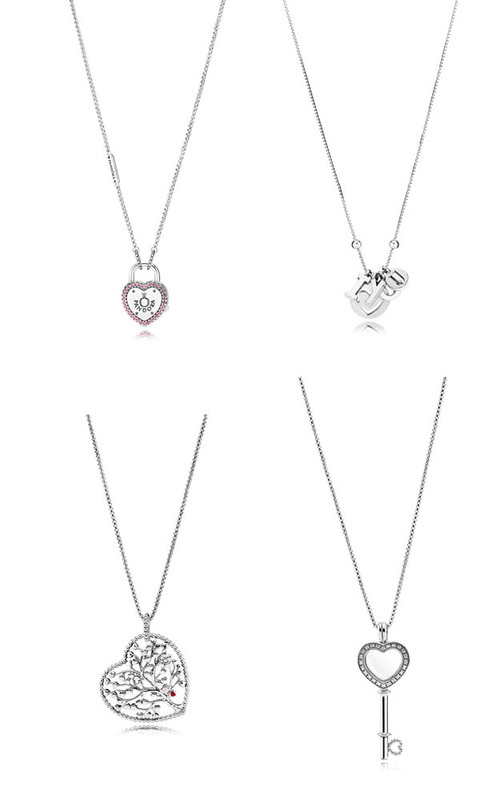 The new Pandora Signature collection has added some heart pendant designs in both silver and Pandora Rose as well. 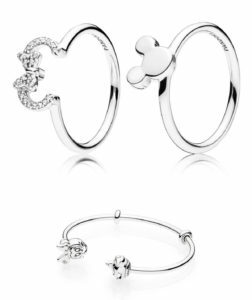 One of our favorite additions in the Mother’s Day Collection is the Pandora Rose version of the wishbone rings released during the holidays! 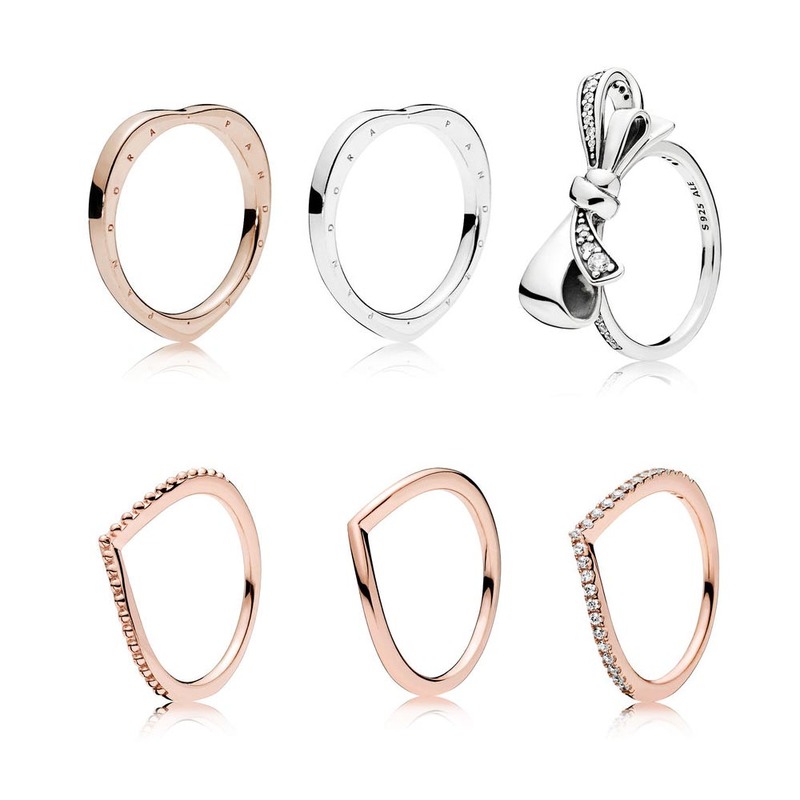 These look great stacked together or stacked with their silver counterparts. 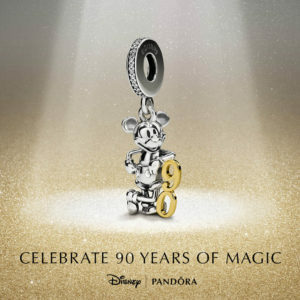 The Shimmering Wish with its sparkling CZs is particularly pretty! 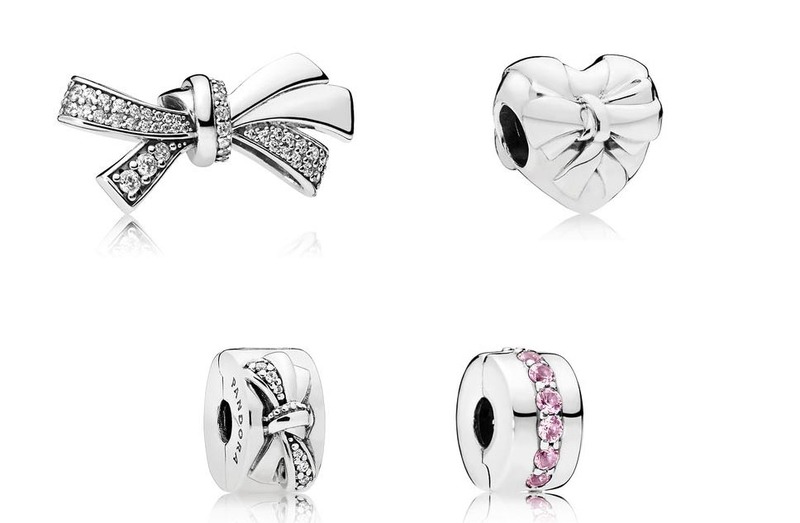 There are also two new Pandora Signature rings, one in silver and one in Rose, and a Brilliant Bow statement ring. 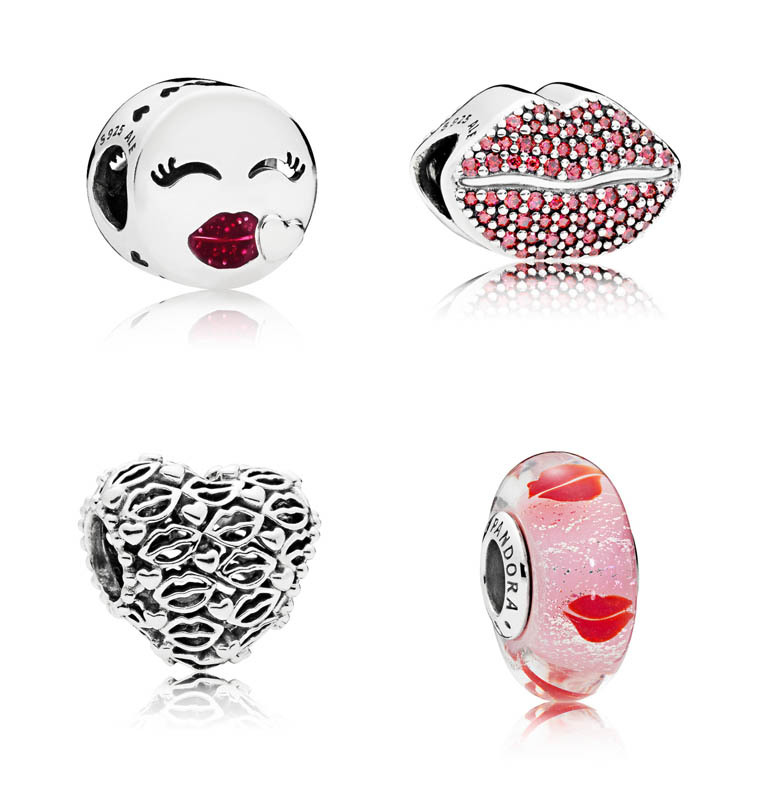 Pandora has continued to innovate in their bracelet designs this year. 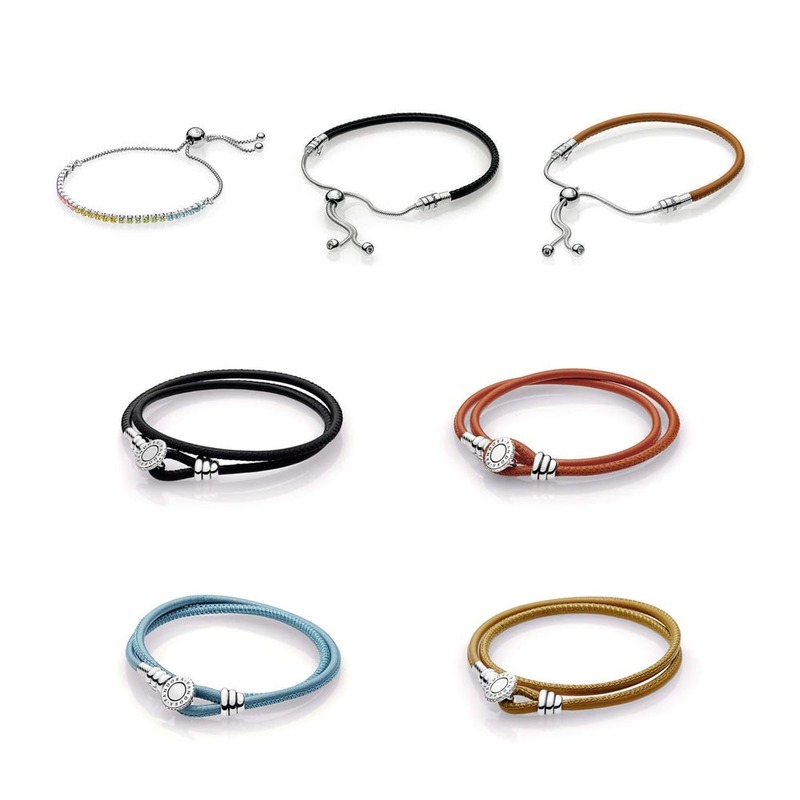 The new bolo-style sliding bracelets, which began last year with the Sparkling Strand, have made their way into the charm line as well. 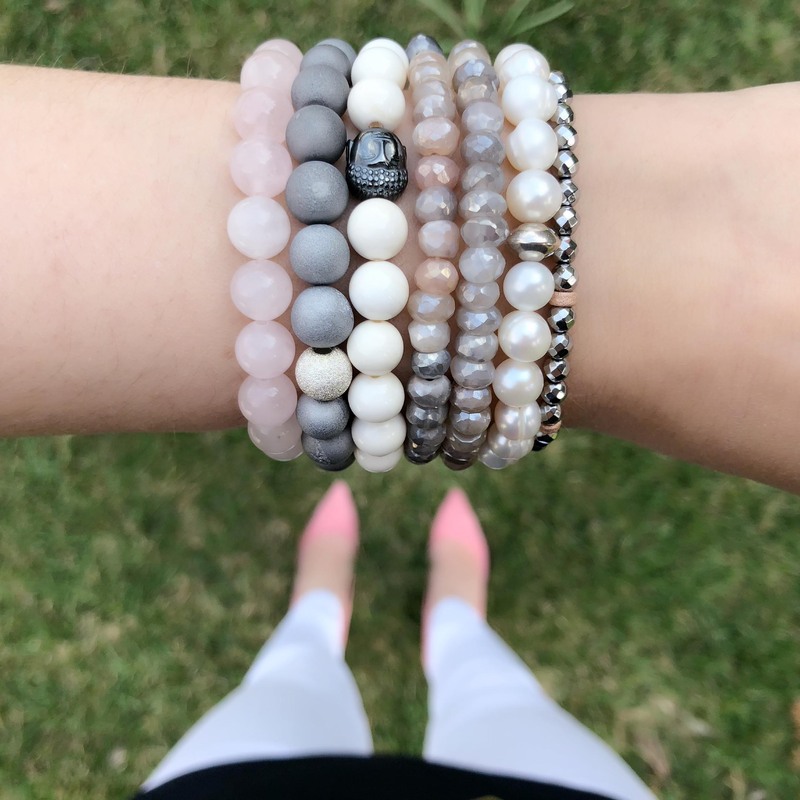 These bracelets adjust to fit any wrist size, making sizing much easier, and have interchangeable ends so that you can make two-tone designs! 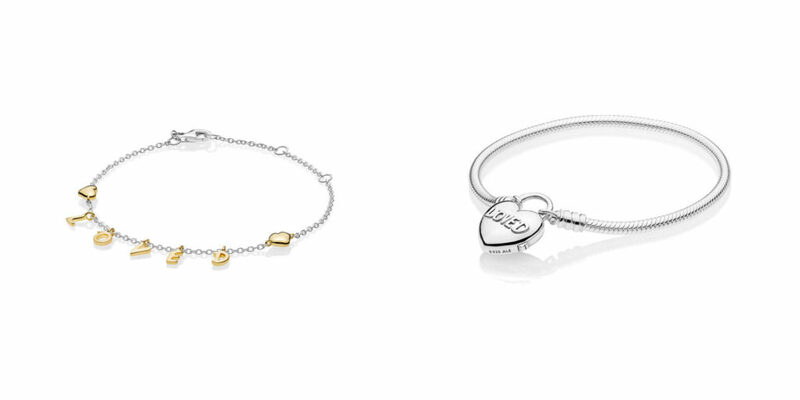 The Sparkling Strand bracelet has also been updated to include a new version with golden colored CZs. 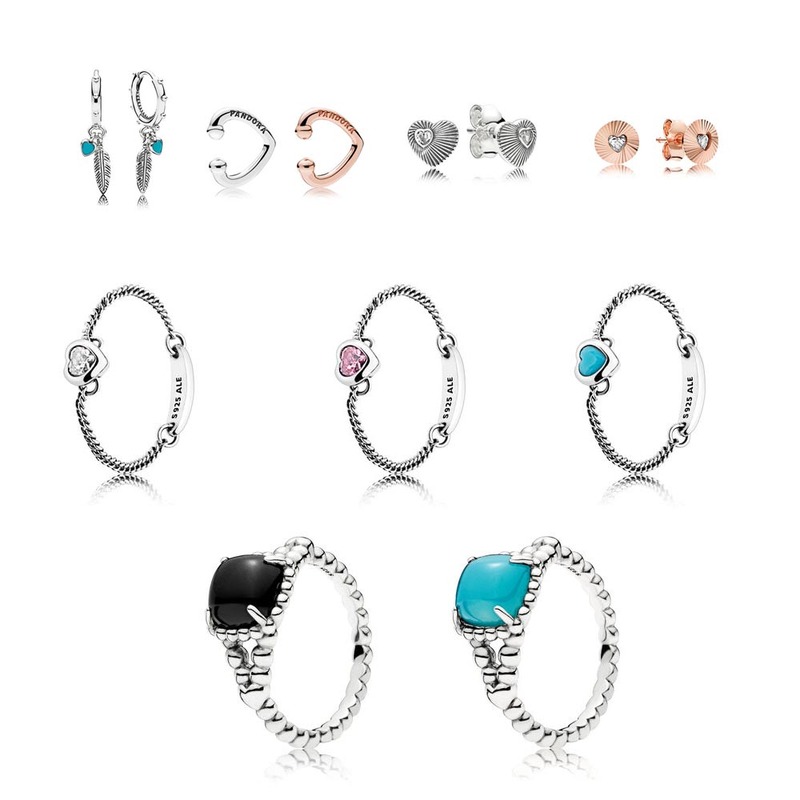 Pandora has also added some new styles to the Essence Collection with it’s Mother’s Day release. 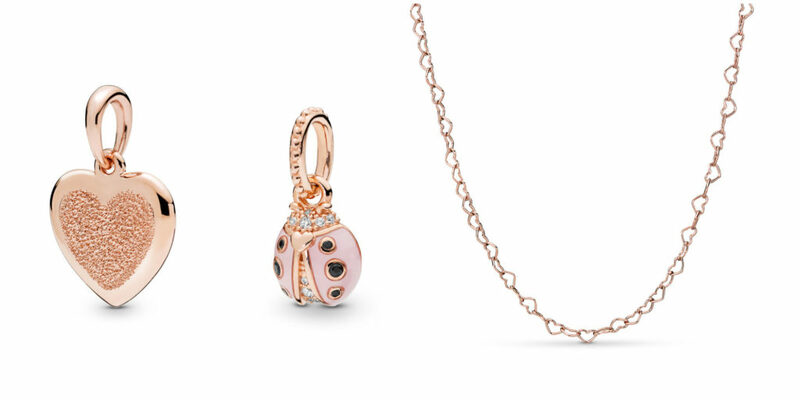 Our favorite addition in the Essence line is the beautiful new Pandora Rose necklace! 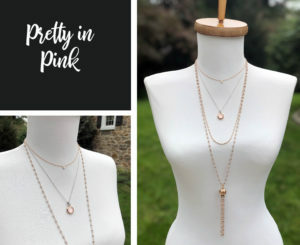 The perfect length, it looks gorgeous styles with Pandora Rose essence charms. 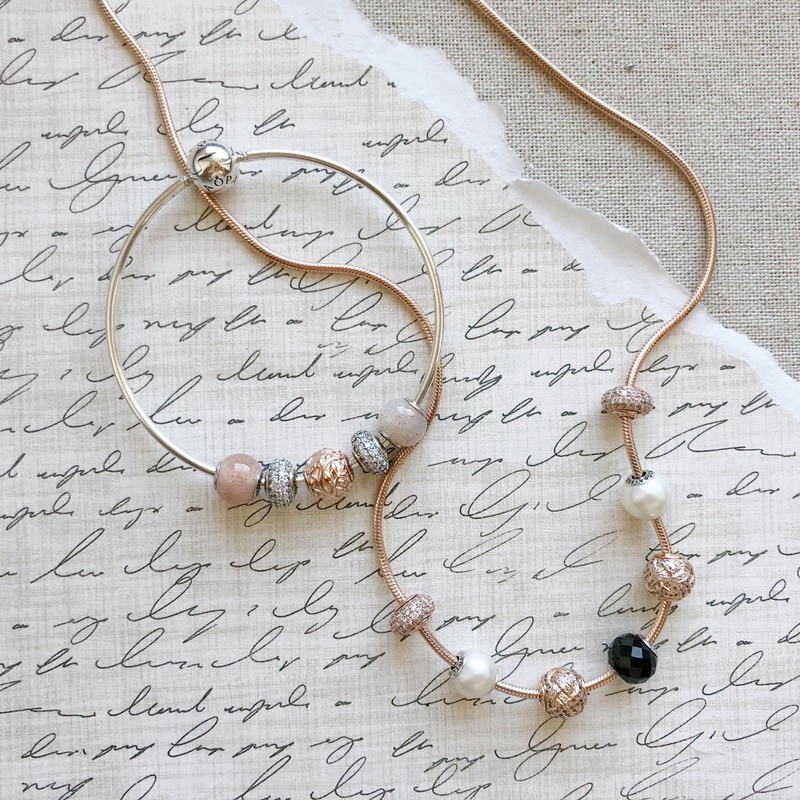 We also love the way the Dignity Pearl charm and faceted stone charms look to add some contrast to the Rose tones. 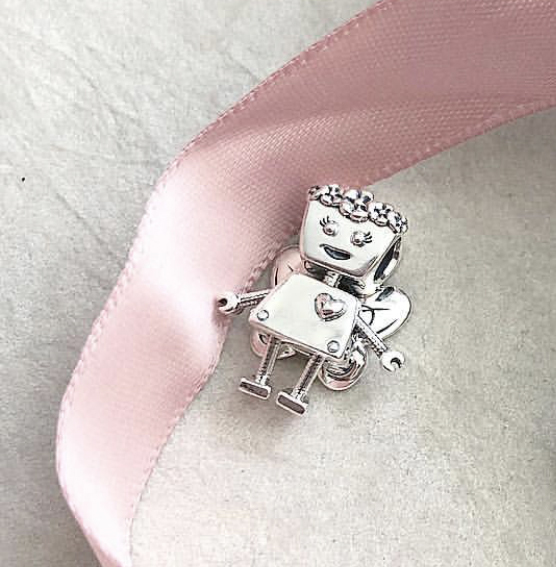 One of our other favorite new pieces is the Love Makes a Family Pandora Rose Essence charm. 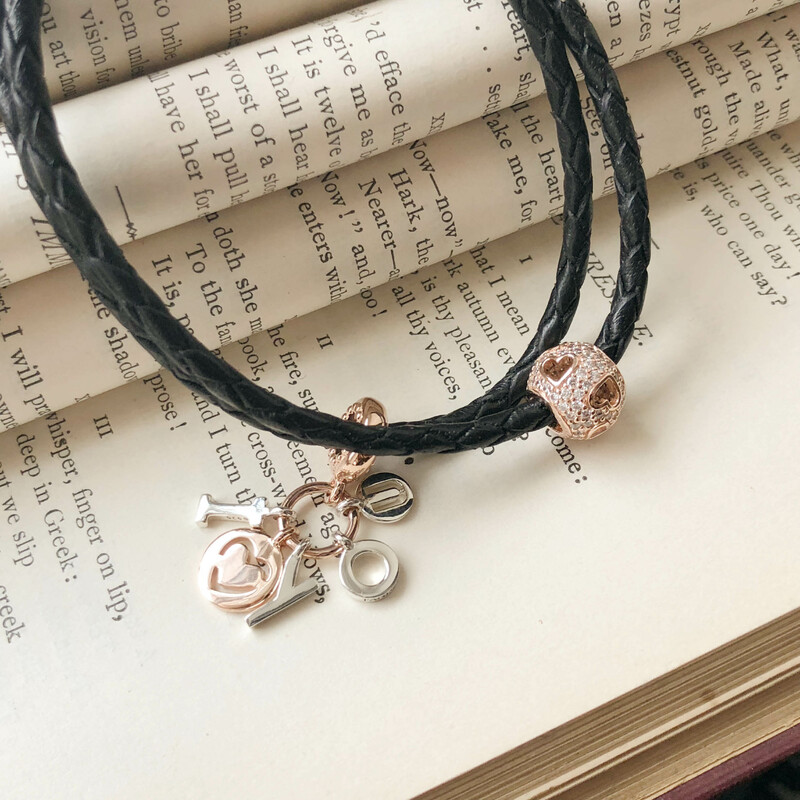 It has a texture of beautiful scrolling vines to represent the branches of your family tree. 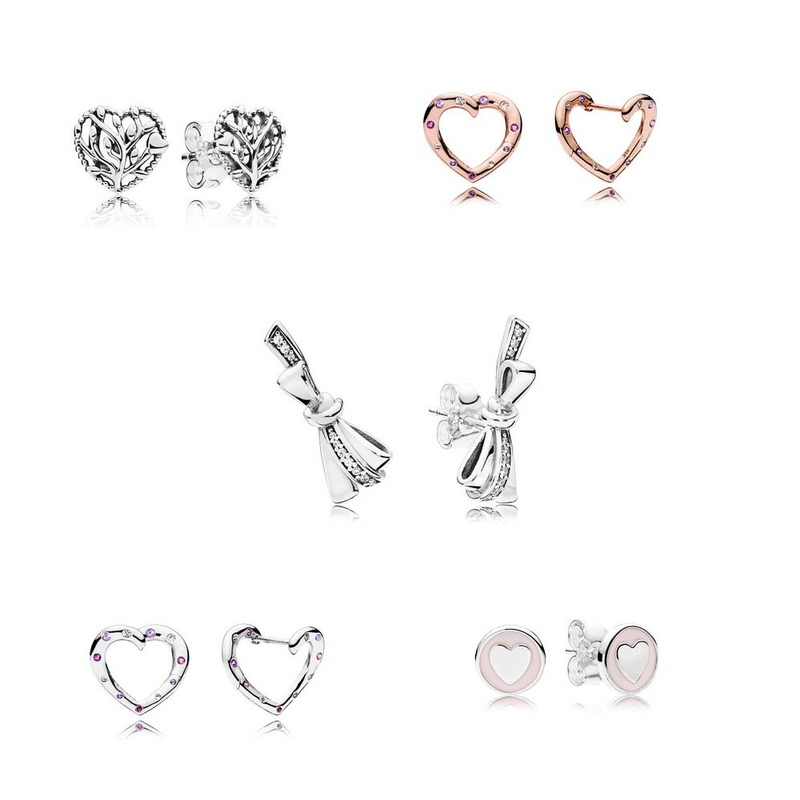 Other additions to the collection include new smooth Follow Your Heart spacers in silver rand Pandora Rose, Rose versions of some of the silver dangle charms, and the Bonds of Love charm which has a rose cage encases a blush pink crystal. 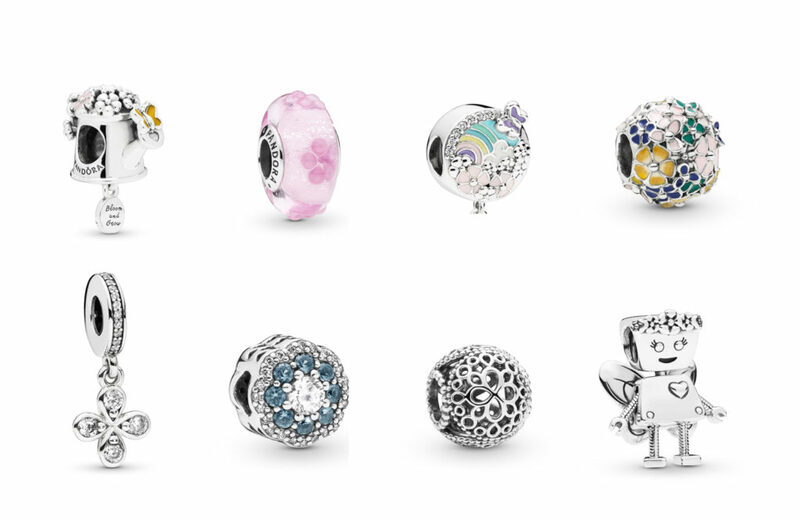 The last addition to this year’s Mother’s Day Collection are the new Pandora Disney charms. 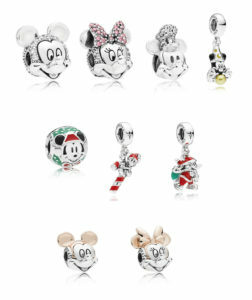 This season’s new additions focus on the iconic Mickey and Minnie and their adventures as a couple. 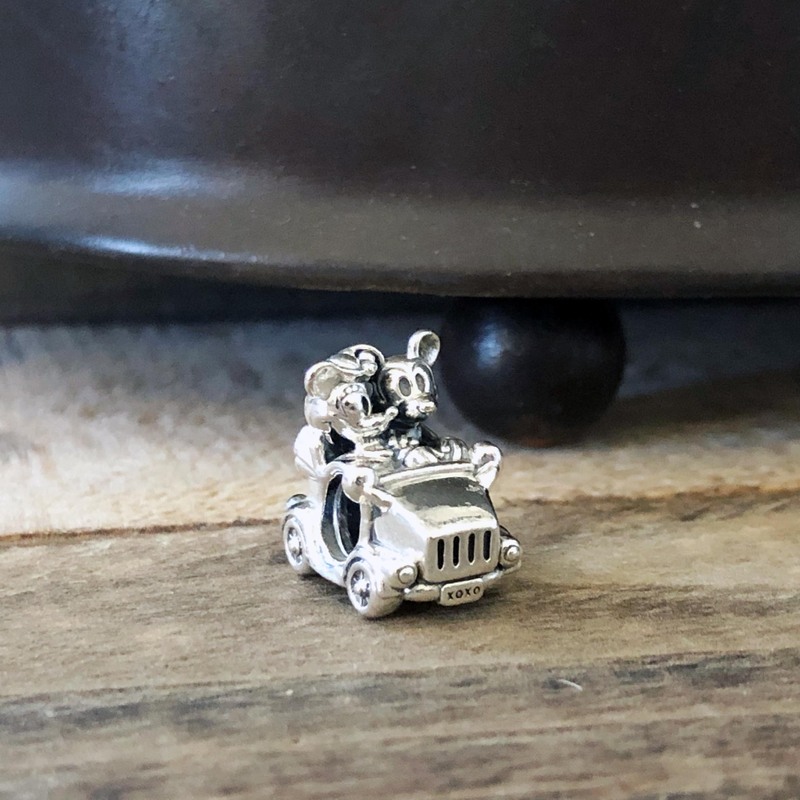 We particularly love the whimsical Mickey & Minnie Vintage Car charm- it has so many details! 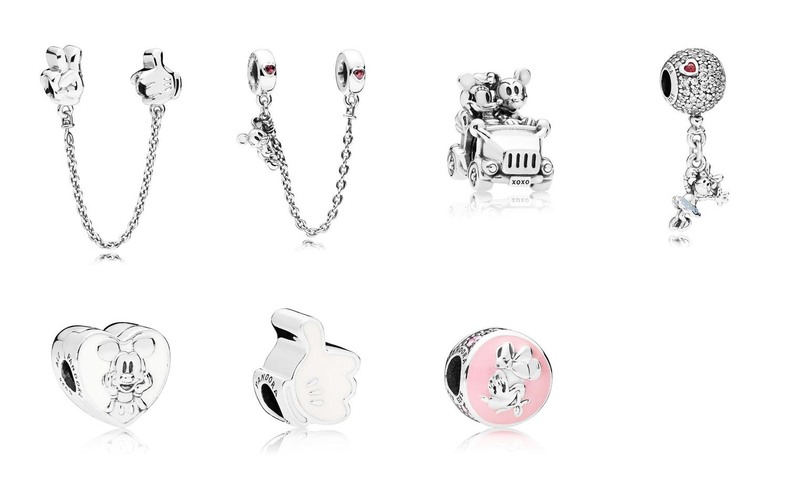 Other new additions include two new safety chains, a Floating Minnie Dangle, a new Vintage Mickey clip with white enamel, Mickey’s glove, and a Vintage Minnie charm with pink enamel. 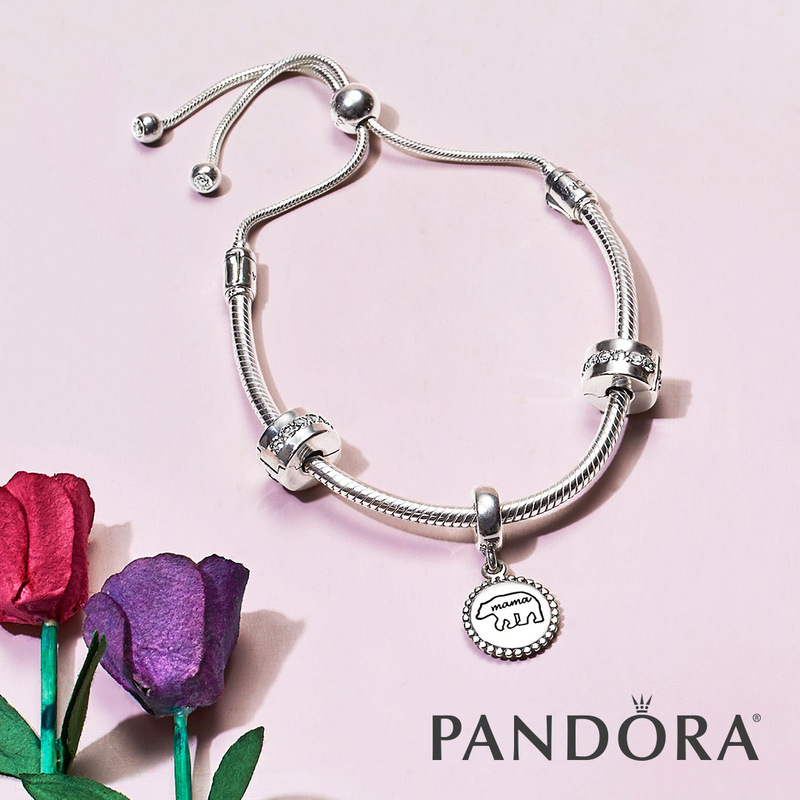 We hope you love the new Pandora Mother’s Day collection as much as we do! 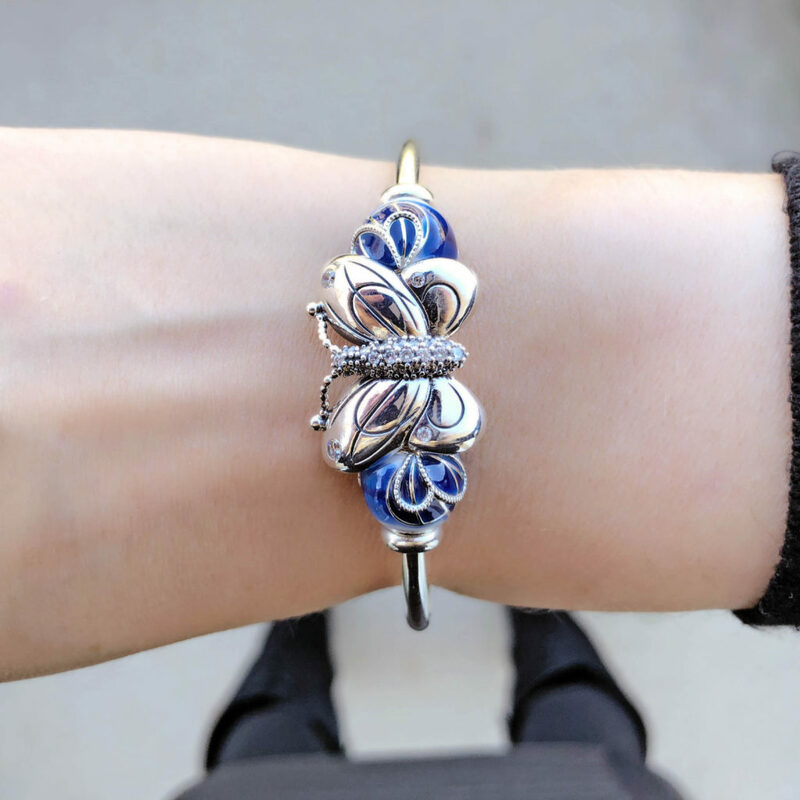 Stop by Versant in person to see all of the new pieces in person and let us help you style them into a selection that mom will love. As always, we are grateful to all of our customers who choose to #shopsmall and support our local small business.